Can you tell the difference? I’m not sure that there is one. I love vintage scales. I only have a couple of them but anytime I spot one I think my heart skips a beat. 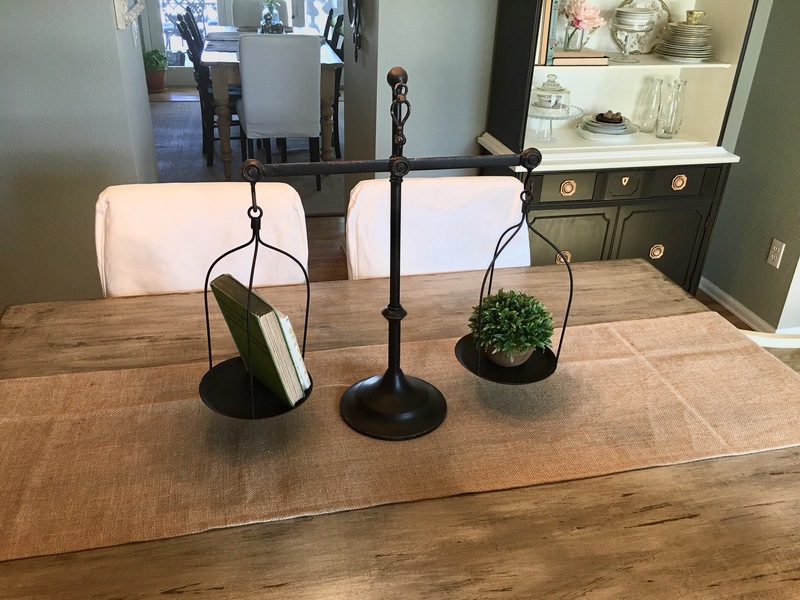 I first saw this scale on Fixer Upper. 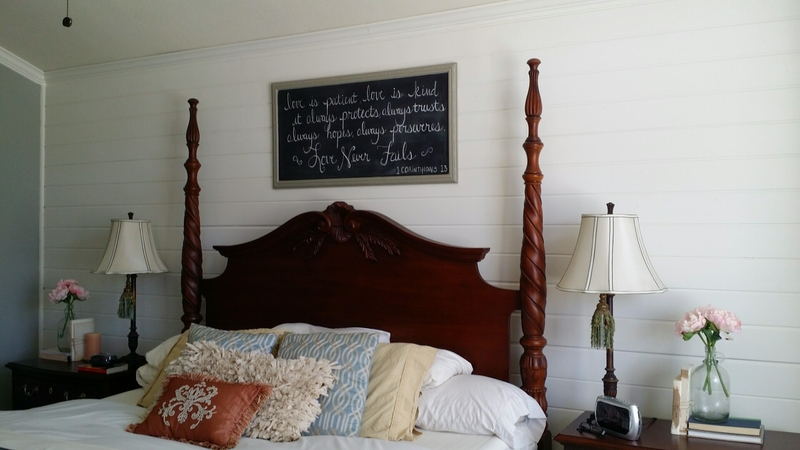 (My ALL TIME favorite show on HGTV…..along with a bazillion other addicts like myself). I don’t know how many reruns of episodes I’ve watched. I may have an official problem. But seriously, are both Chip and Joanna not just so incredibly talented? Their creativity is spot on EVERY single time. Anyway, I’ve purchased from the Magnolia Market website. I’d truly like one of every item. 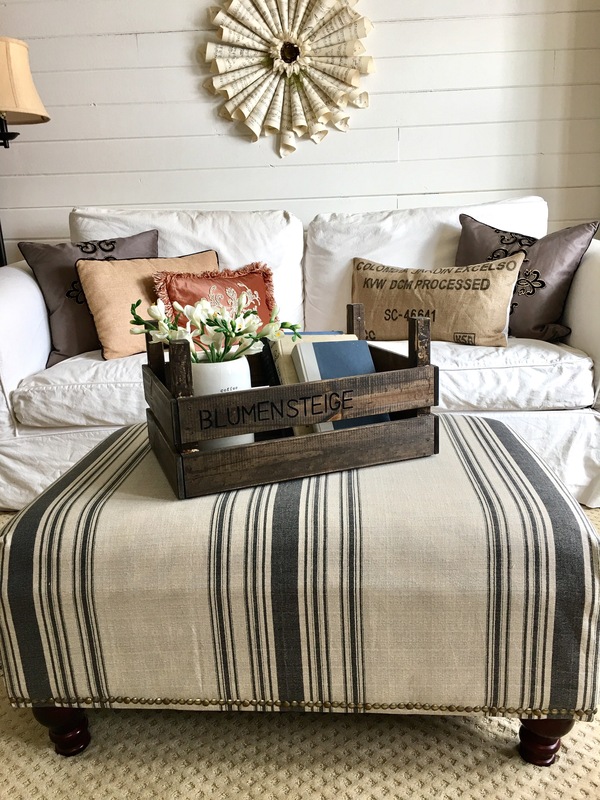 I first fell in love with the Dutch tulip crates. So I ordered one when it was on sale. And I will say that was an awesome purchase. I think it arrived at my house within a few days. It made me want to do cart wheels. It’s been on my coffee table ever since. 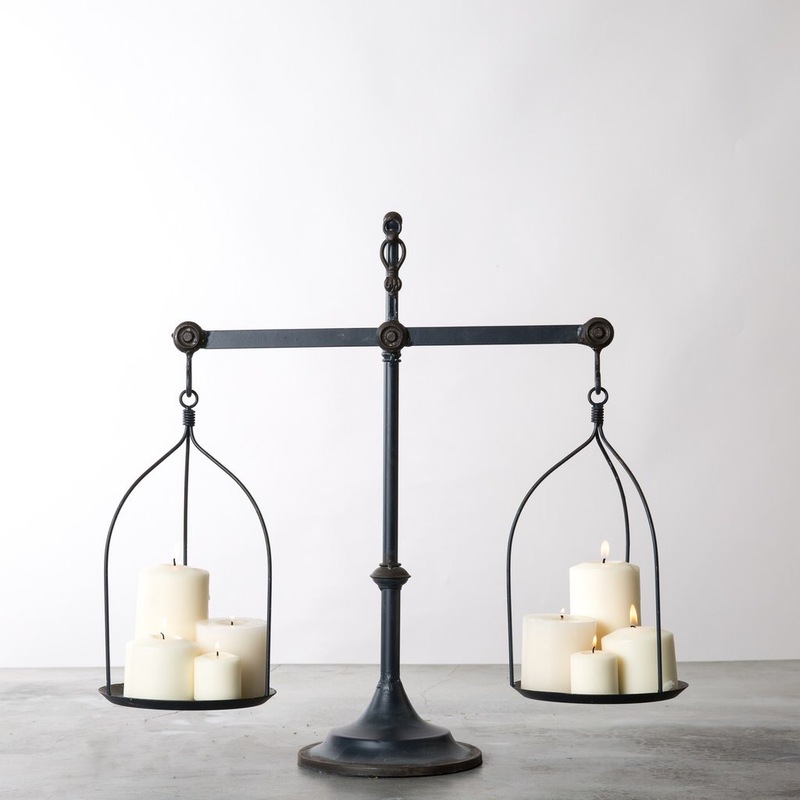 But that balance scale was calling my name….albeit a little pricey. 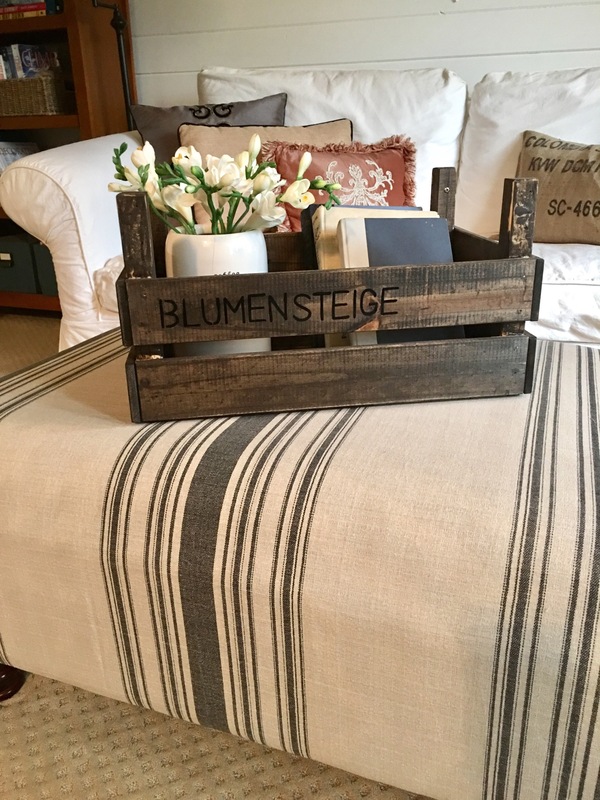 It’s charming, super versatile……..And recently discontinued. What???? So sad. 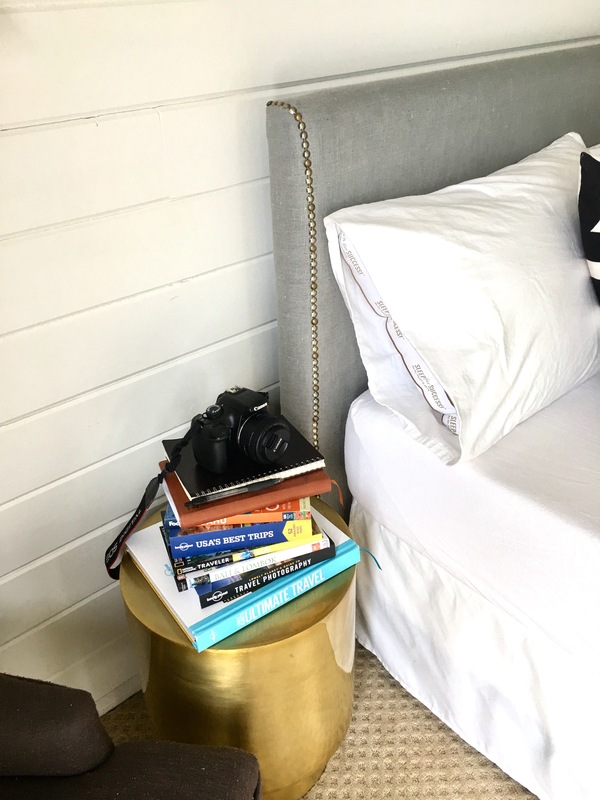 I think it was a God thing because recently I received my daily email from decorsteals.com and guess what was the steal of the day…….? And for half the price of the other one. Shazaam! 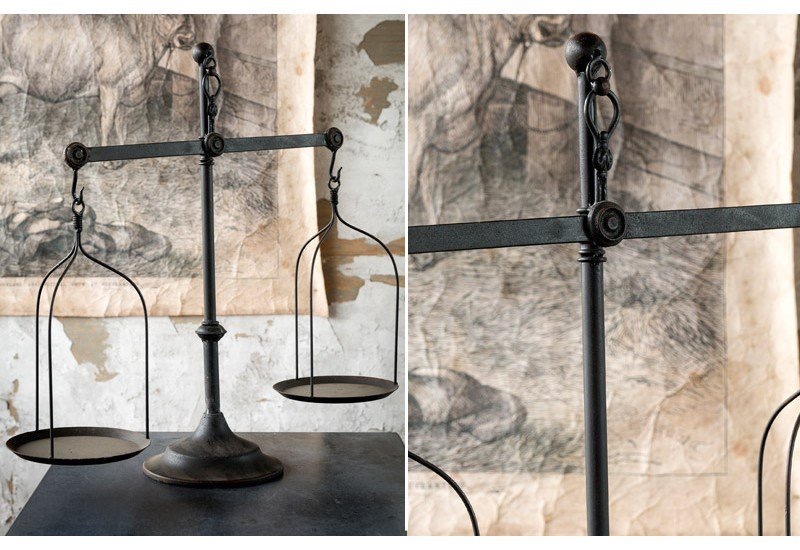 Now this scale did take over 2 weeks to arrive, but worth the weight (hee hee, wait). I did not realize that it does not ‘actually’ balance. Which ended up being a bonus. 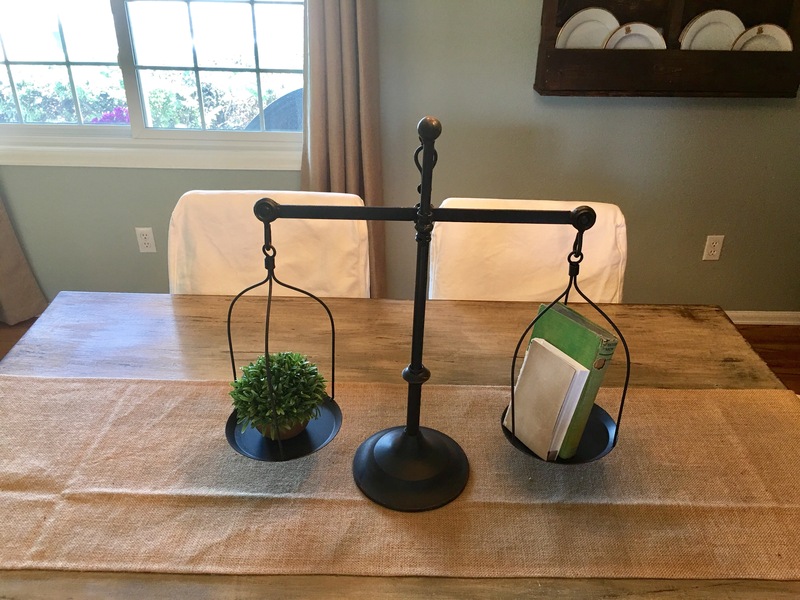 Doesn’t matter if one item is heavier on one side that the other, as it’s perfectly balanced all the time. 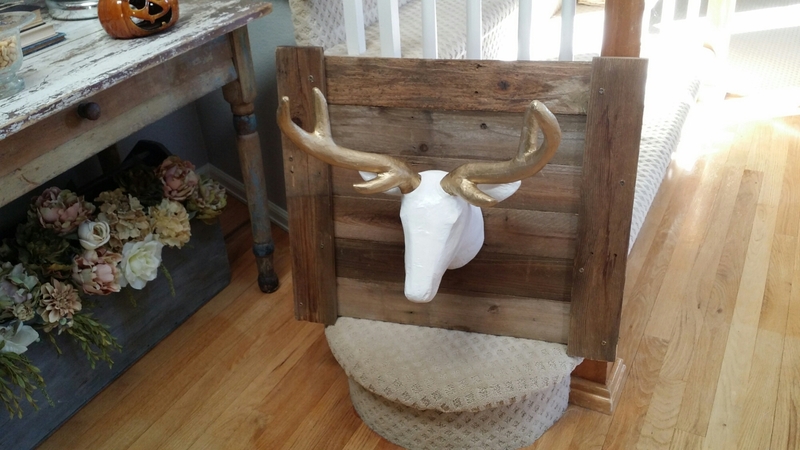 It’s interesting and a super decor item. I’m a lover of a good bargain. Sometimes, certain things can be overlooked if the price is right. 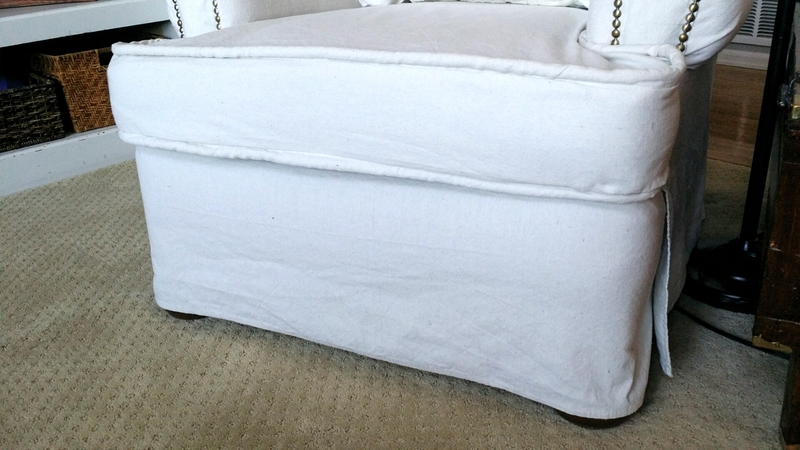 Like the damage to this sweet ottoman when I purchased it. So, it didn’t always look this way….it actually began here. This is the original material that came on the ottoman. And yes, I purchased it…lovely rips in the fabric and all. Initially, I envisioned recovering it right away. 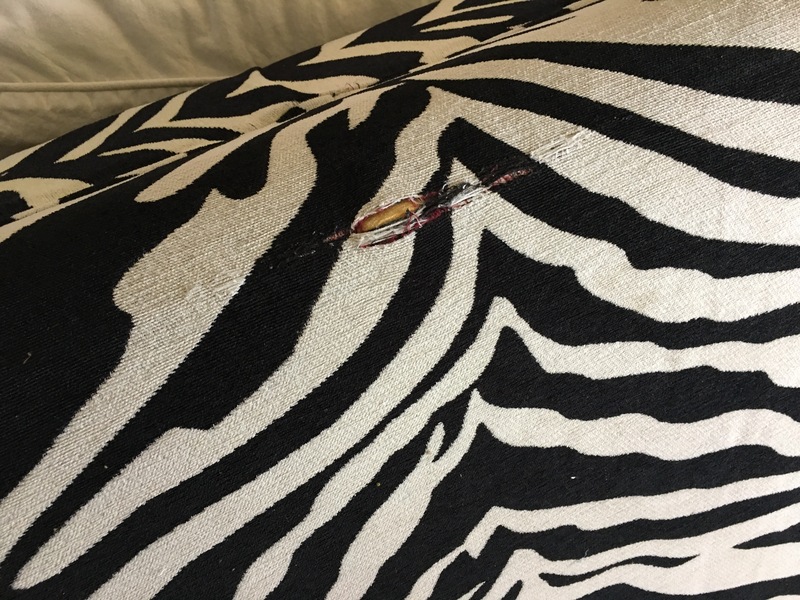 But time, kids and life got away from me and I’m sad to admit…I used it like this for several years (with the rips facing the couch), so not super noticeable. Fast forward and I finally recovered it with this fun material. 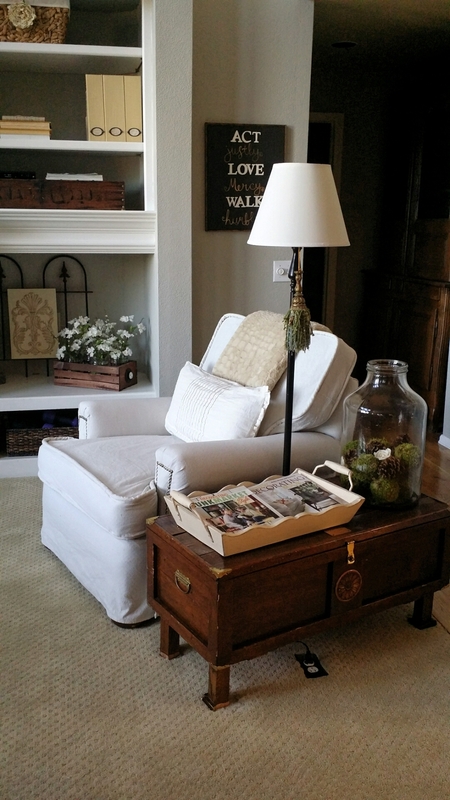 While my taste and design style has evolved slightly over the years, I’ve always leaned toward more of a relaxed look. I mean, we have 5 kids, so our home is totally lived in. This fabric was great for a season (several years), but it was begging for a change. Enter drapery panel. Yep, drapery panel. 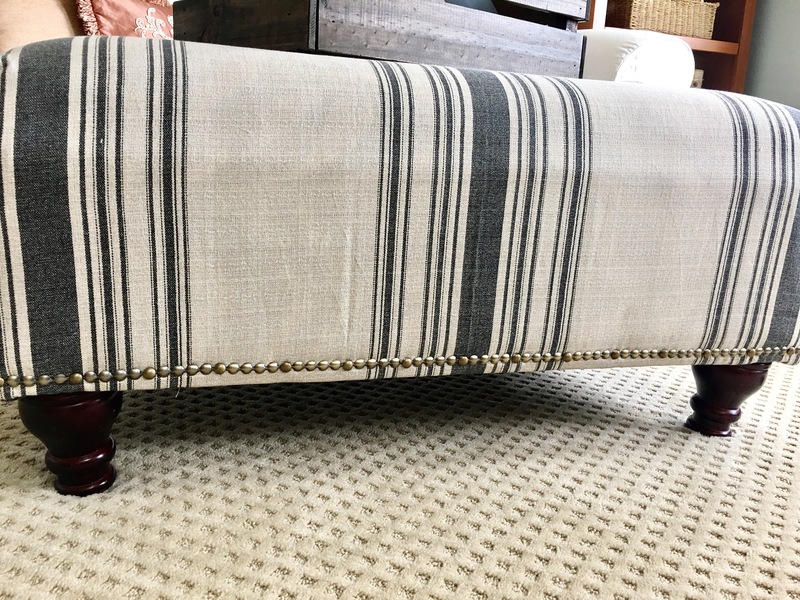 I have been looking to reupholster this in sort of a grain sack fabric. I love the various looks, colors and patterned stripes of grain sack. 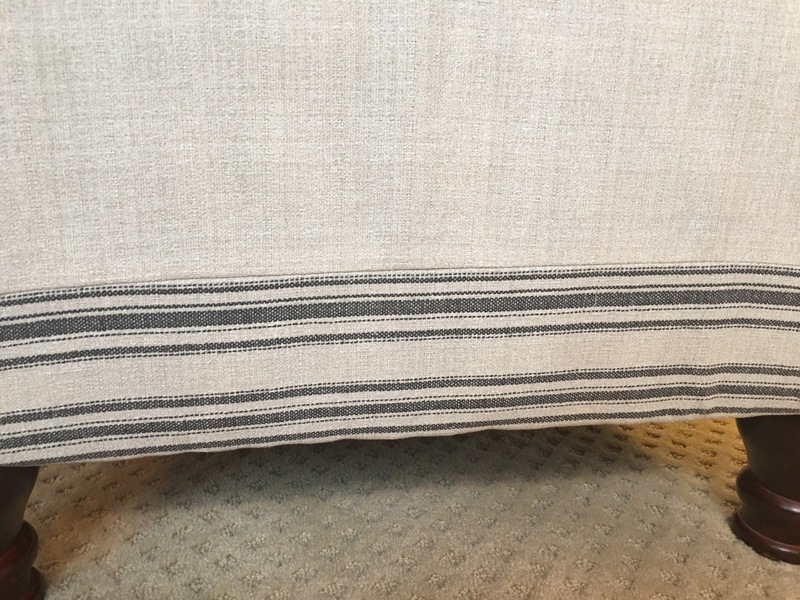 I was about to pull the trigger on ordering some of that material when I stumbled upon this look alike fabric, in the form of a curtain panel, at Hobby Lobby. Using my coupon, I scored this for $17.49. Even reproduction grain sack would’ve run me 3 times that. 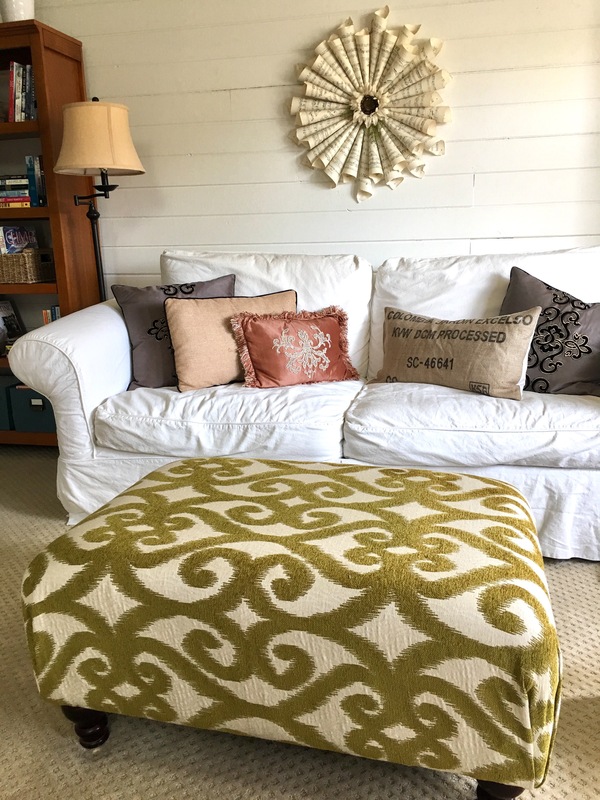 Because the panel wouldn’t fully cover the width of the ottoman in either direction, I did have to cut and sew the end pieces on. 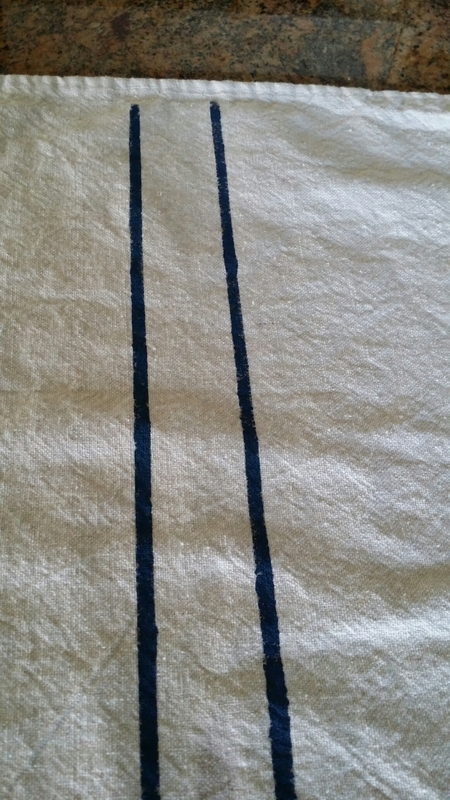 However, because of the stripes I was able to line it up quite nicely and the seams are almost unnoticeable. Can you see it just above the top thin stripe? 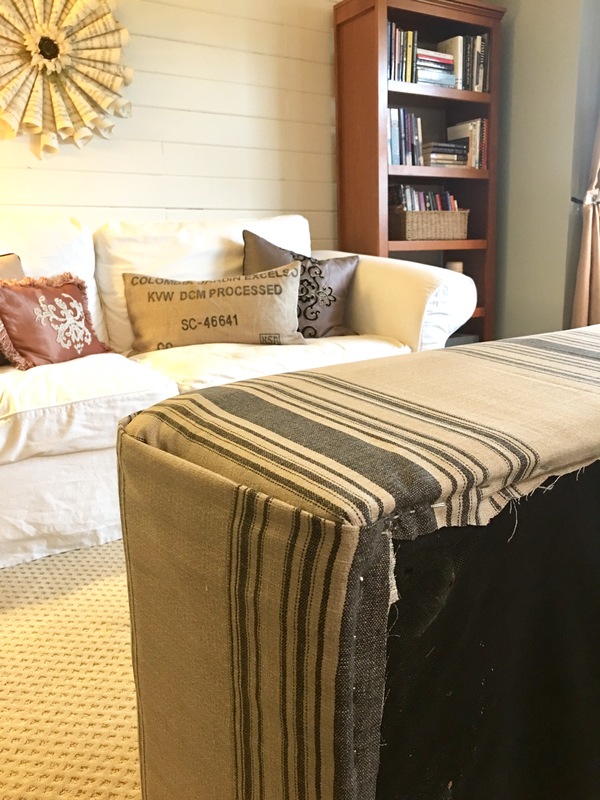 I removed the legs, since they unscrew easily, and used a staple gun to attach the material underneath the edges of the ottoman. 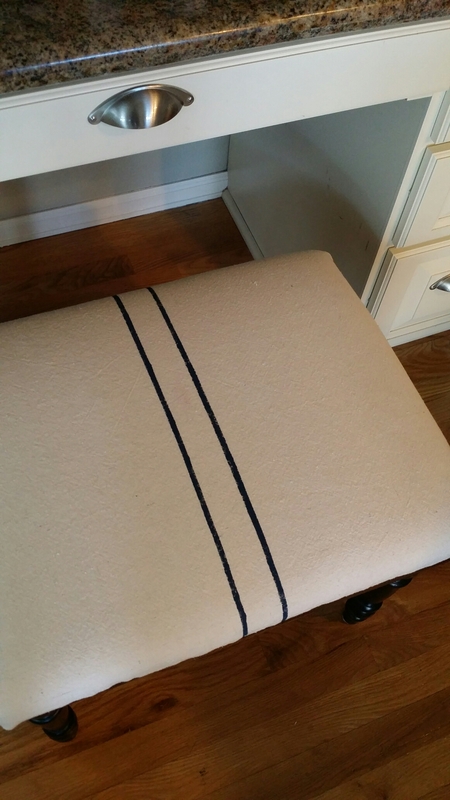 I measured the stripes and centered them on the ottoman before stapling. It helps to tack one side, smooth the material, pull it taught, and staple the opposite side. Then I created a simple fold down each corner. 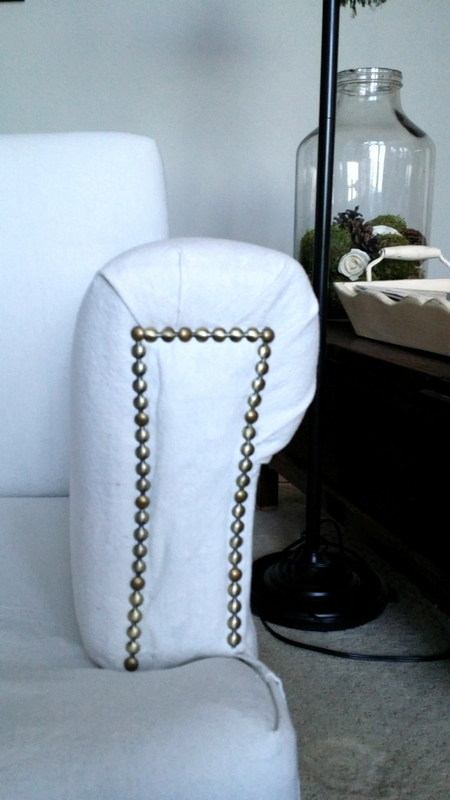 The finishing touch is the nailhead trim. 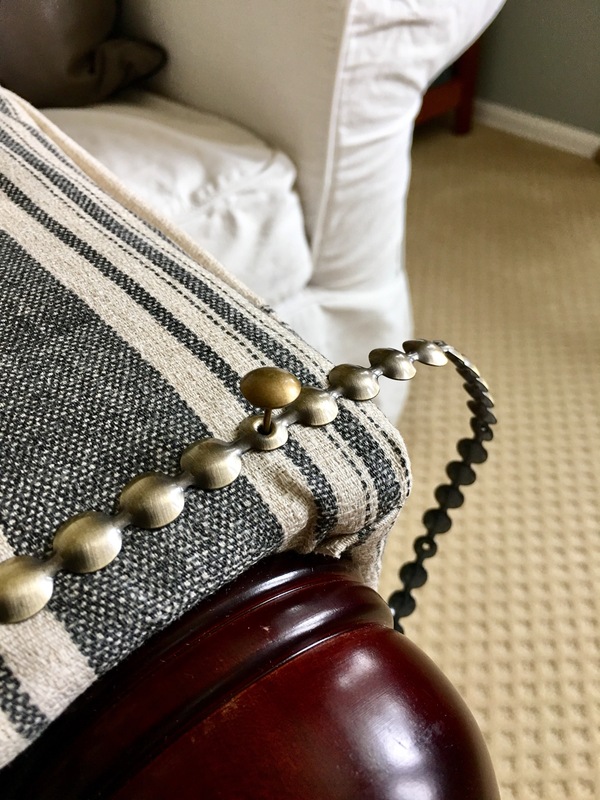 I’ve used this product on other furniture that I’ve reupholstered. I purchase this at Hobby Lobby as well. Super easy to use. It’s the antique gold. I lined it up and got busy tacking it down. This trim looks like it’s loads of individual gold tacs. 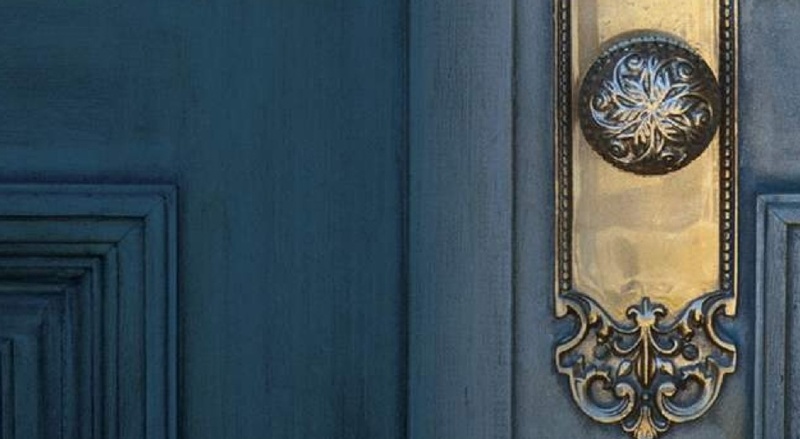 However, there are 4 faux tacs in between each actual opening. 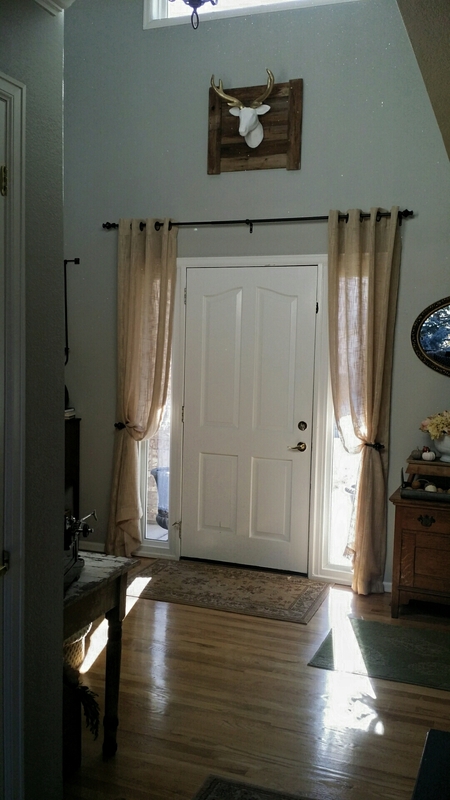 I like to lay out the trim and then tac every other hole, going back and filling in. I just eyeball it, so for me it helps to visually keep a straight line. 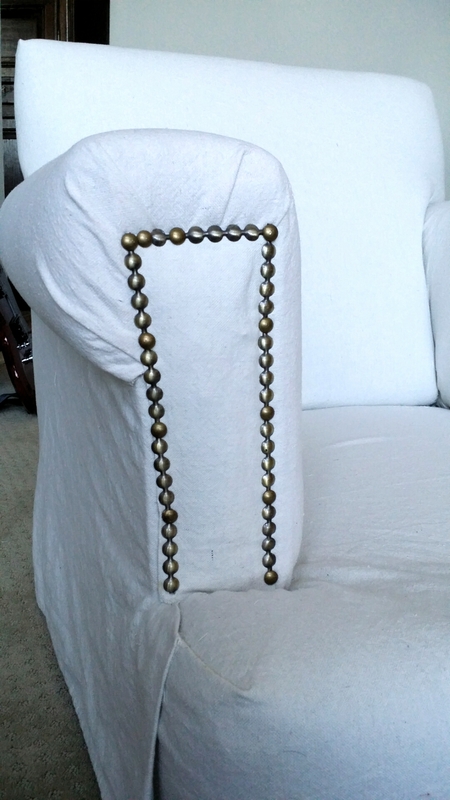 My confession, my left over nailhead trim only allowed me to go half way around the ottoman. So let’s pretend it’s all finished. Ta-Da!!! So much better. 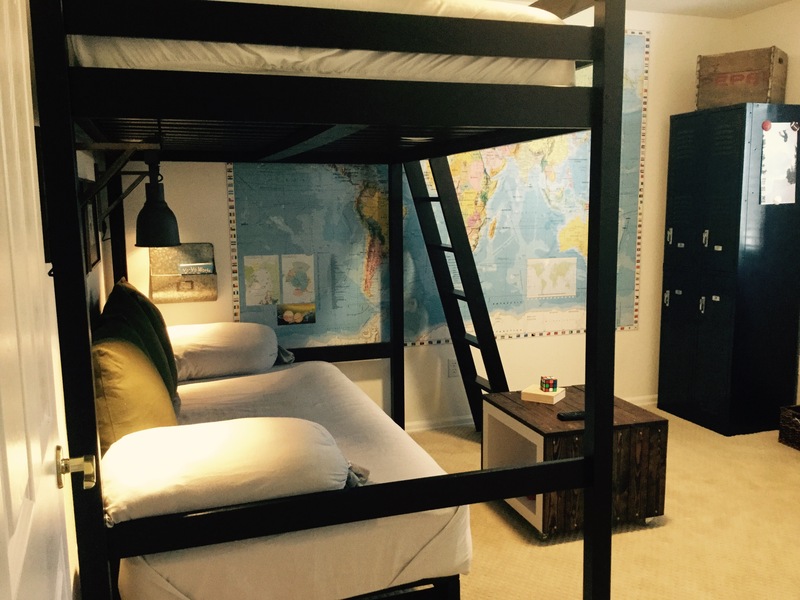 Several years ago I shared a post re: our daughters bedroom. 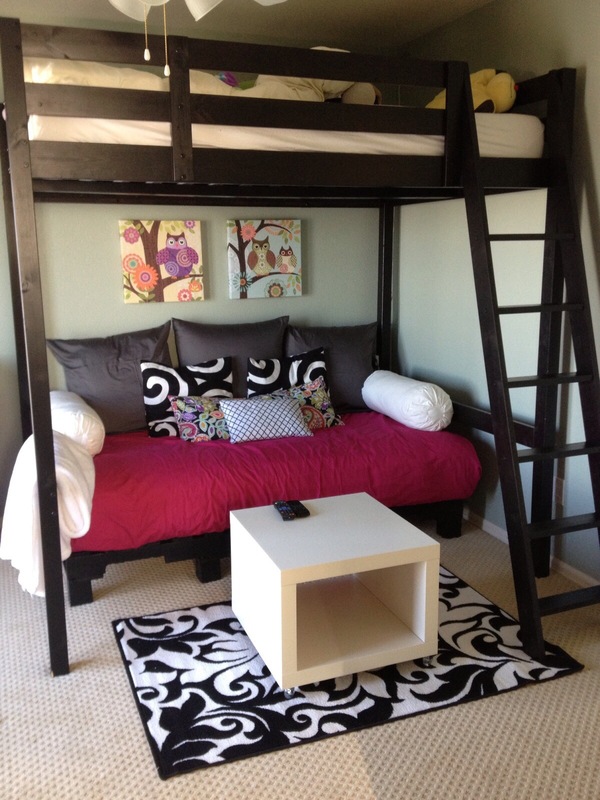 She had a fun loft bed and my hubby and I built a pallet day bed/couch/lounge area to sit underneath it. This was her set up. Great for friends, hanging out and she loved it. (Please ignore the unmade bed up top). This combination is still getting pinned on Pinterest daily. I only know, because I receive the notice on my phone…..and to date its been pinned 9.5 k. Which is a bit hysterical. It’s fun to watch that number continually increase. Guess I’m not the only Pinterest addict. About 8 months ago our daughter decided it was time for a change. She, and her taste, have certainly grown and evolved. She is weeks away from 17 now and she is a total Boho, beachy, wanderlust, creative girl. 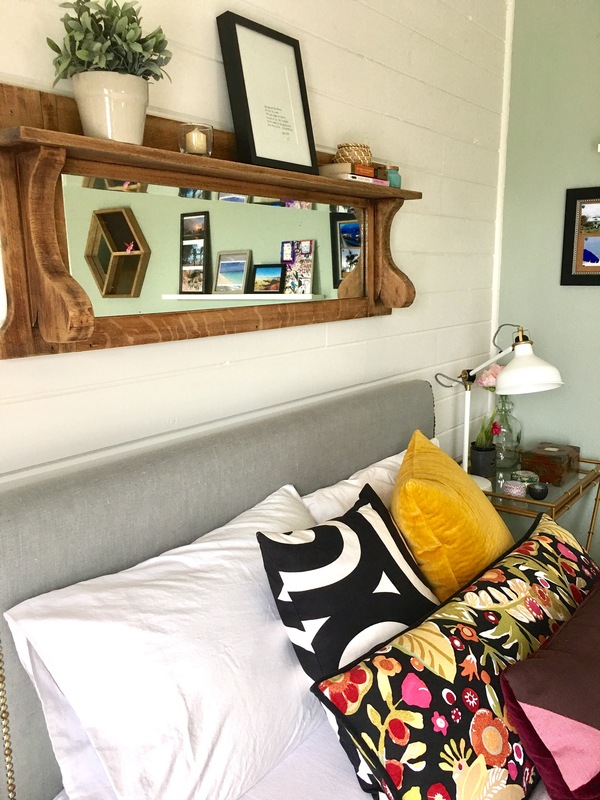 It all started with shiplap. My husband and I had put it on a focal wall in our master and on another wall downstairs in our library/music room. 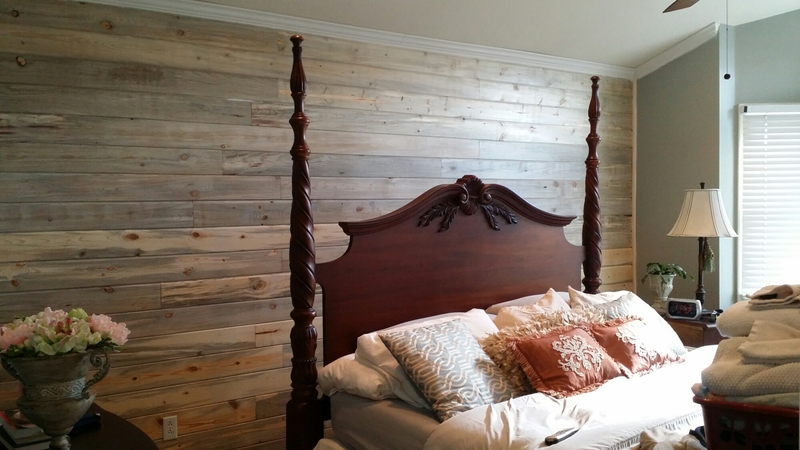 She knew instantly that she wanted some shiplap in her room. 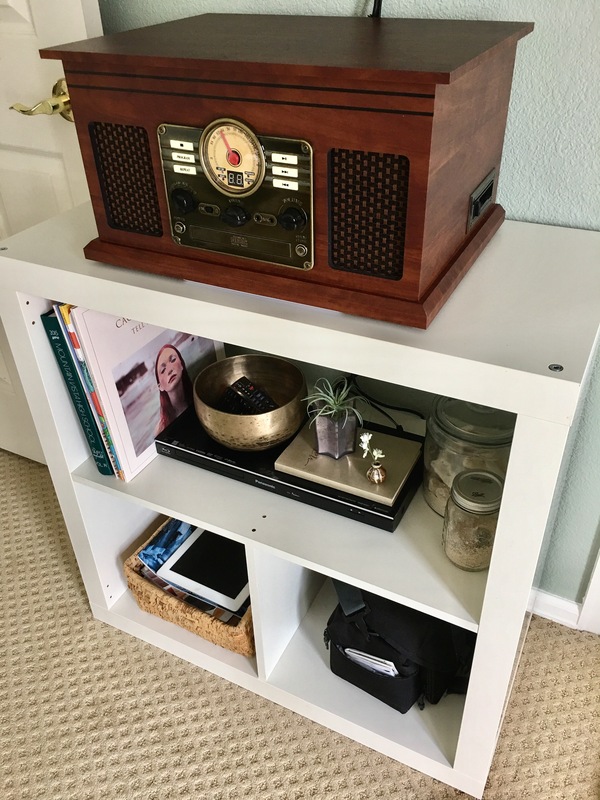 Our youngest son, now 14, was dying for her setup in his room and that worked out grand. So we were recreating 2 rooms at once. Here’s his set up that I posted a few weeks ago. Because we have a walk out basement, our daughters room is actually 3 stories up from the backyard. She has a sweet deck w/French doors off of her bedroom. 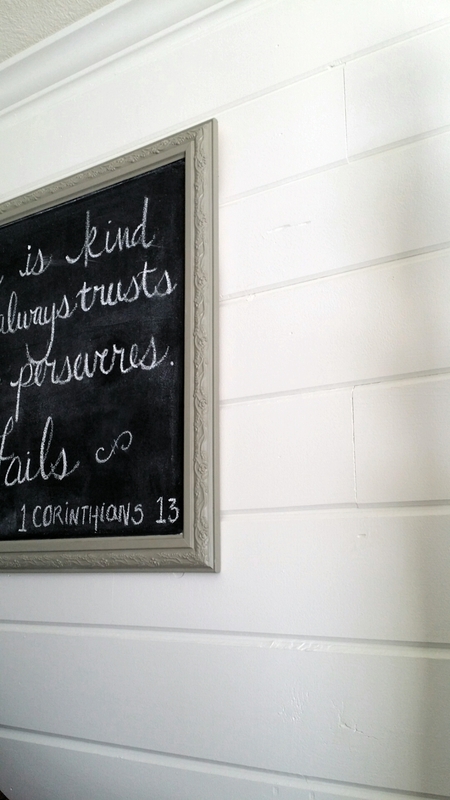 (Every teen girl should have this off of their room). Her views of the mountains and downtown Denver are epic. In fact, she has the best views in the house. We watch about 30+ different sets of fireworks from her deck every 4th of July. 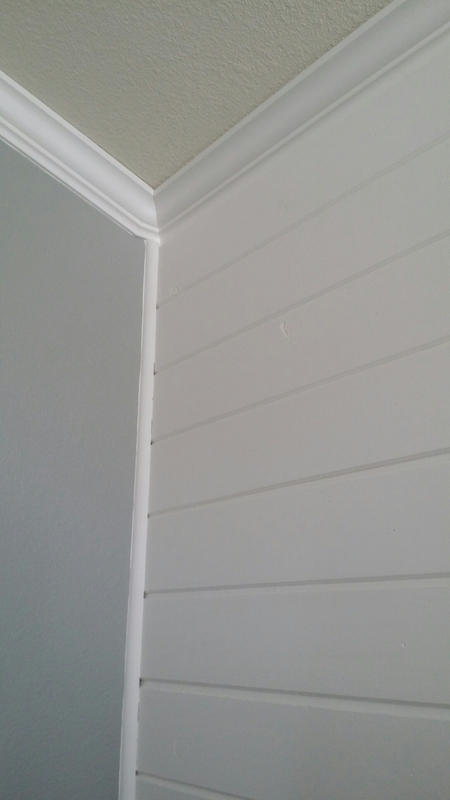 We applied the shiplap to the rear wall. It’s such a fun element. Everything we created and purchased was a total bargain. Mirror above her bed went to an old buffet that I rehabbed for a client and she did not want the mirror, so I stripped the old wood stain down and hung it above her bed. The faux tapestry is a throw rug from TARGET (we couldn’t find one she really liked). 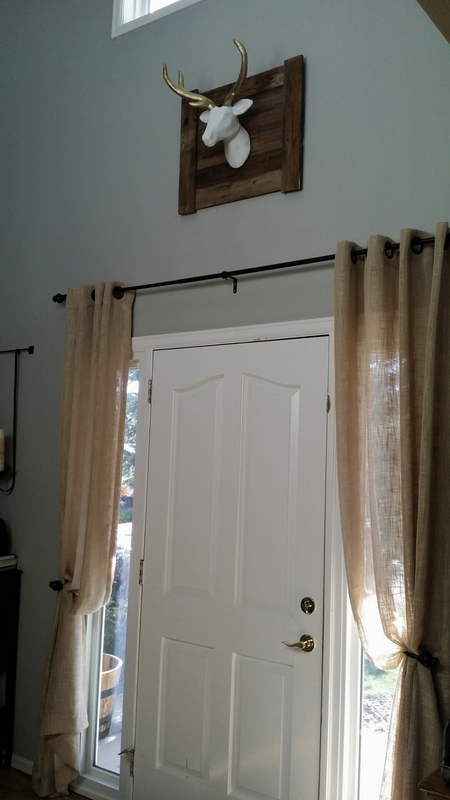 I stained a wooden dowel, drilled holes through it and attached the rope. 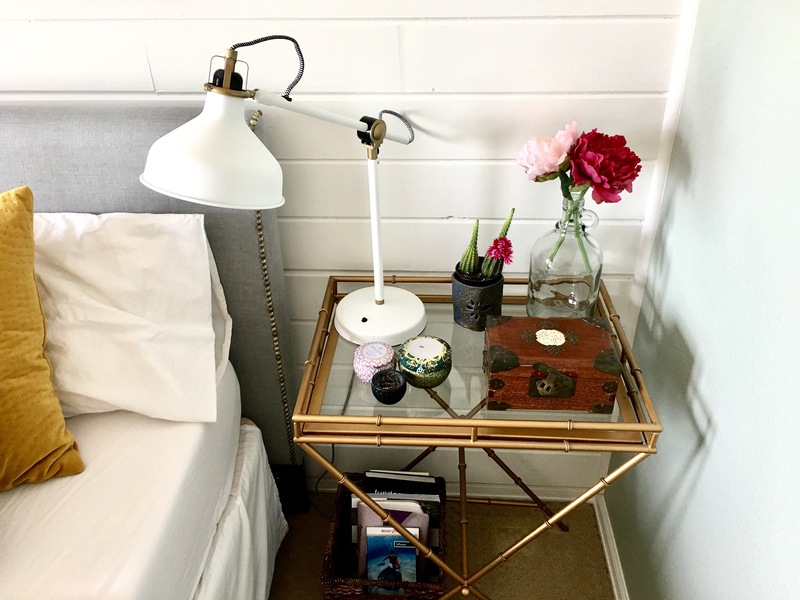 Cute little side table was a clearance find from TARGET several years ago…it was sitting in my master, so I stole it from myself. Looks perfect in here. And the other fun round gold table was an awesome TARGET clearance score that someone had ordered online and returned to the store. 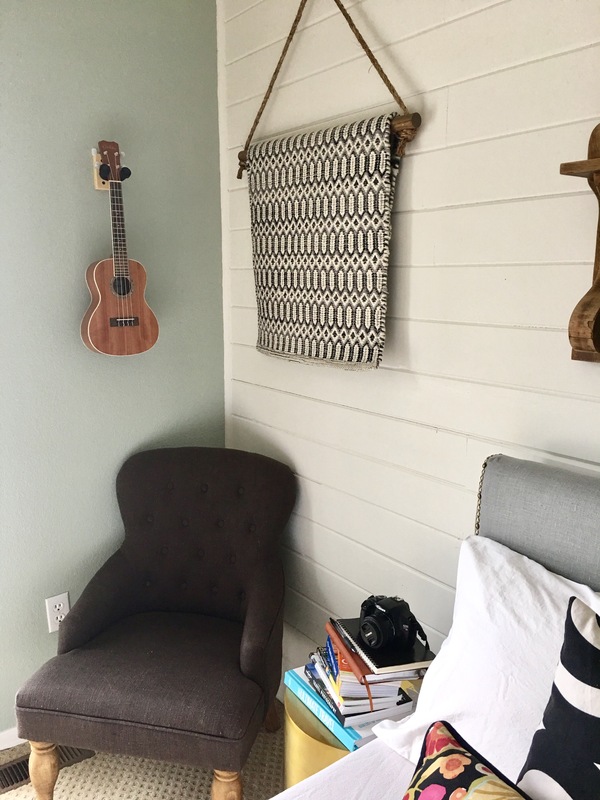 Our daughter sits in this little chair constantly, journaling, looking at many travel and photography books or playing her Ukulele. 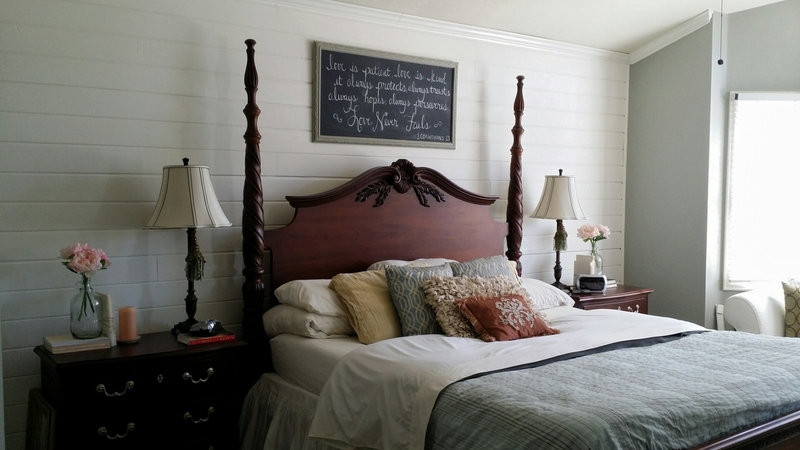 Her headboard is from our old guest bedroom. 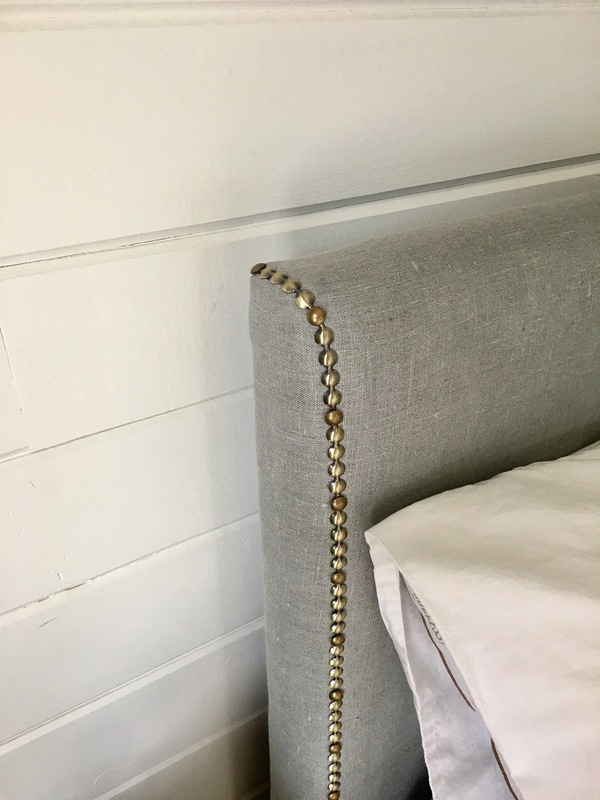 It is a cheap ‘pleather’ headboard. That just wasn’t going to cut the mustard in this room. 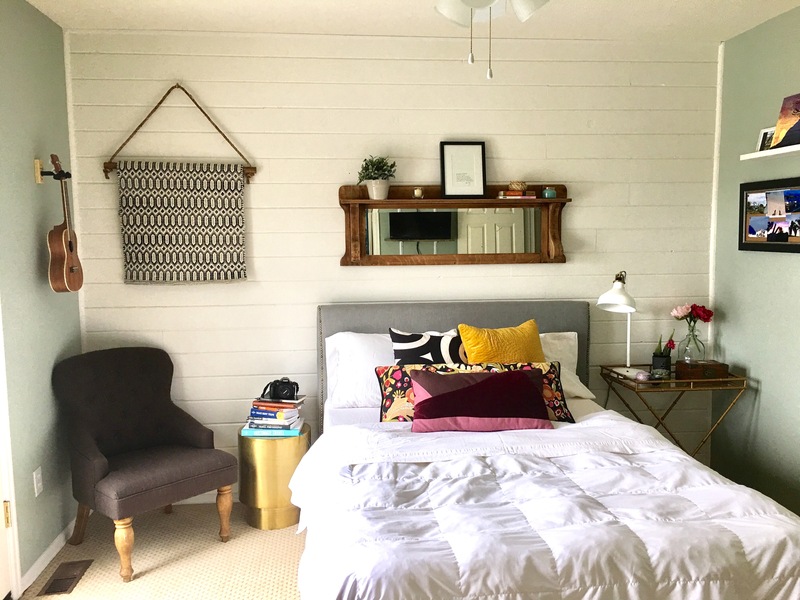 So I purchased the grey linen fabric from IKEA and reupholstered the headboard. 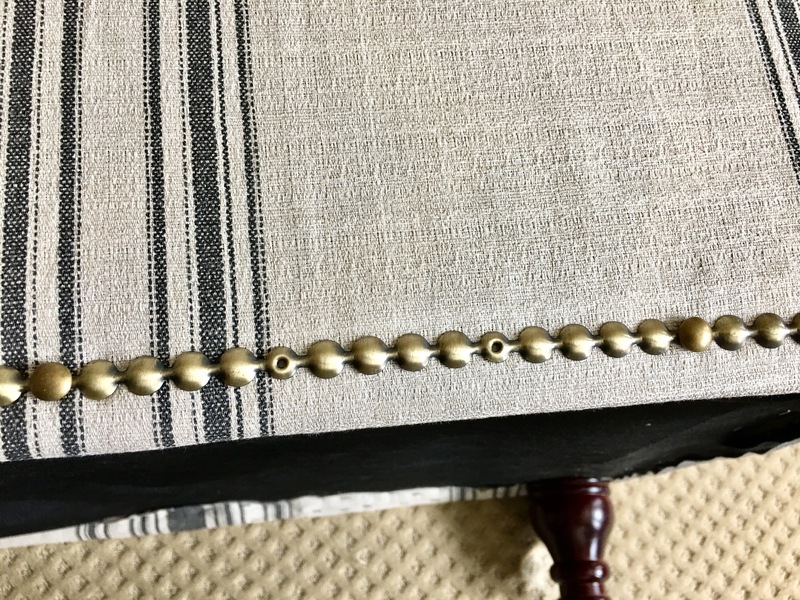 Nailhead trim I already had from reupholstering our TV room sitting chair. We already had the desk from IKEA and the TV stand. 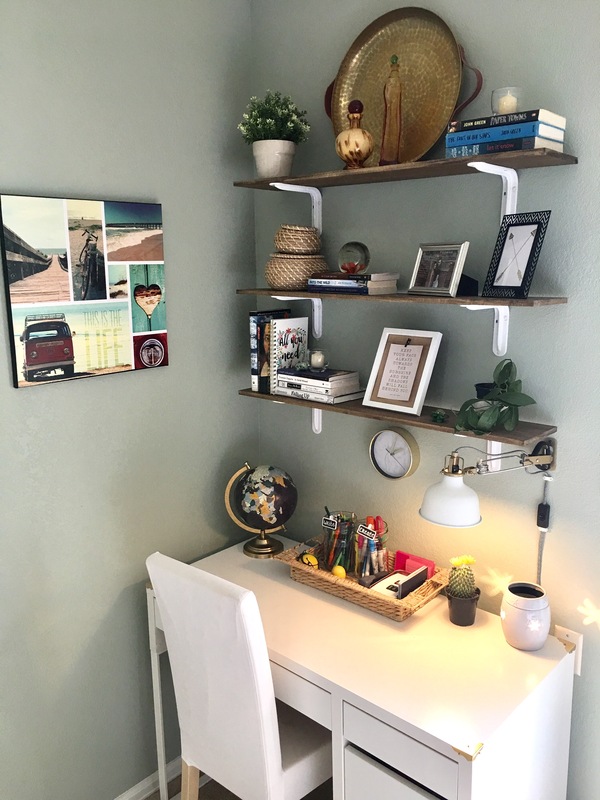 I added decorative corner pieces to the desk from Home Depot, just to dress it up a little. 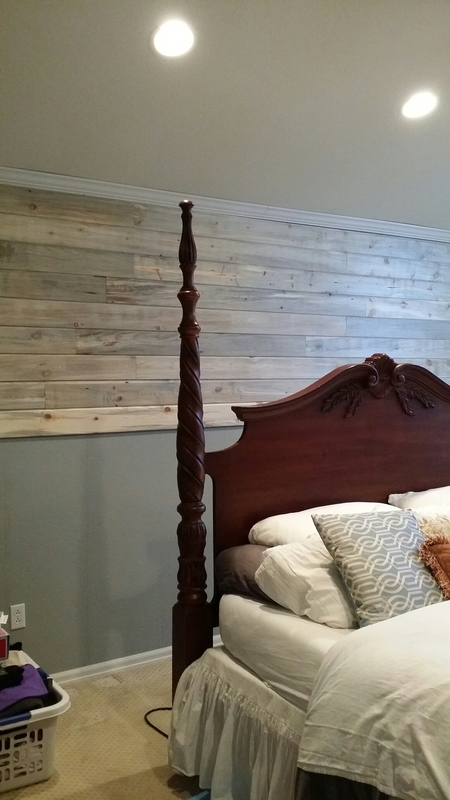 The upper shelves are wood pieces, cut and stained by myself, mounted to brackets and hung on the wall for storage. 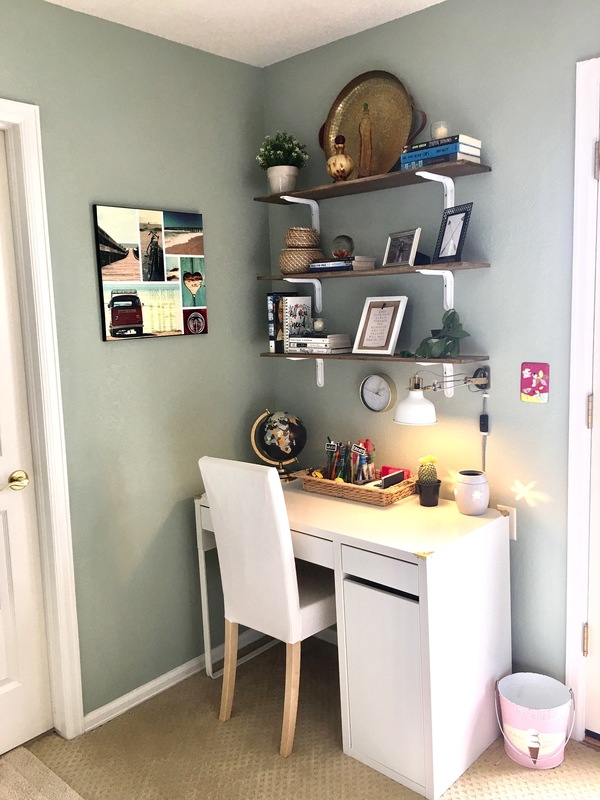 The bedside light and the clamp light at her desk are both from IKEA. I LOVE these lights. I have 3 of the black ones in my TV room area. 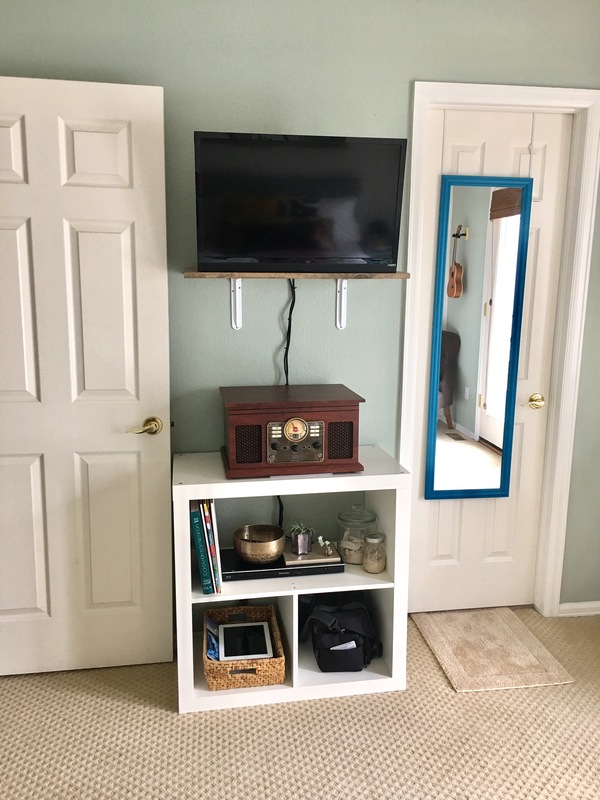 And we did the same type of single shelf over her TV stand for her flatscreen to be mounted higher on the wall. As you can see, we still need to cover the wires. And there you have it. 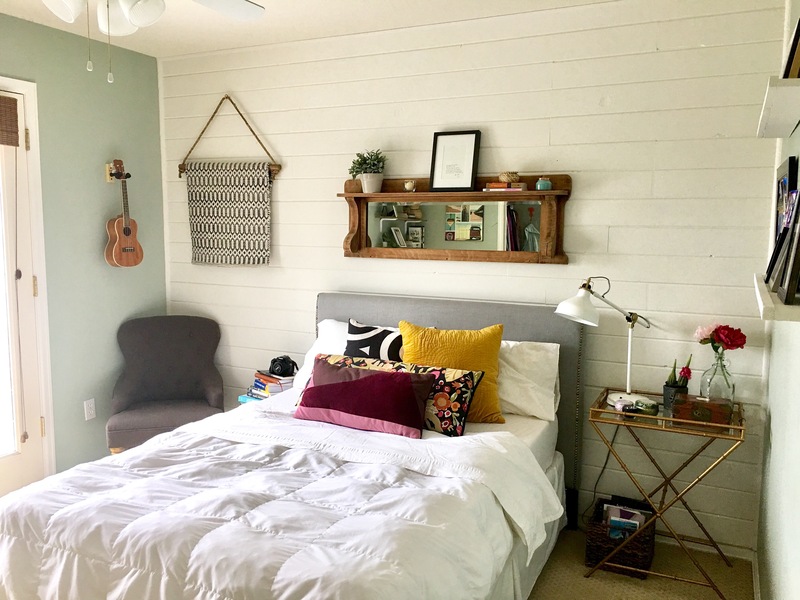 A teen bedroom tweek, gone Boho chic. 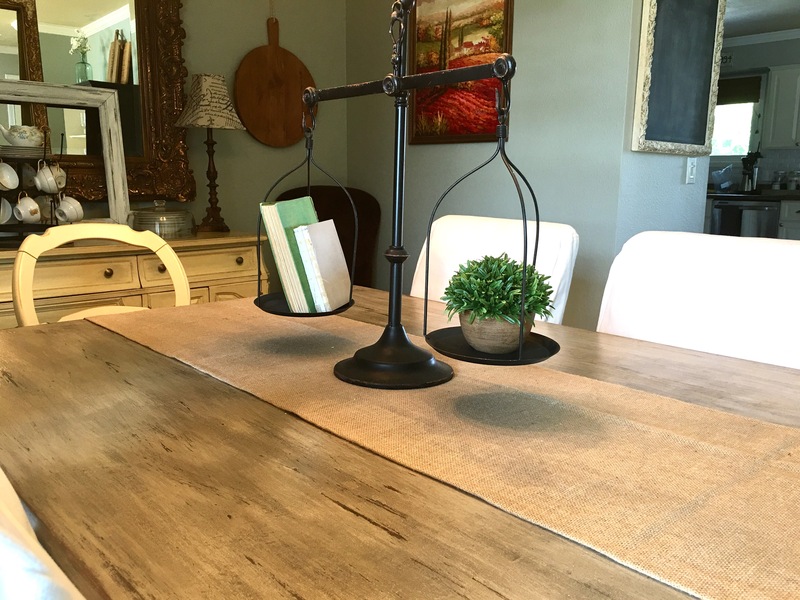 I adore french grain sacks and feed sacks…..just not the price. They can be seriously costly. 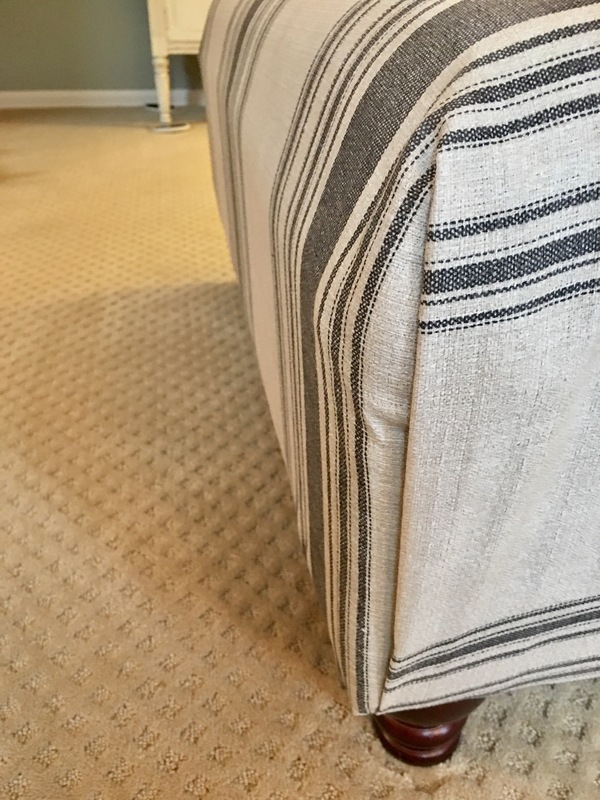 Having just reupholstered our sitting chair with drop cloths, I have quite a bit of previously laundered drop cloth material left over. This makes the perfect alternative to the ever so expensive french grain sack. 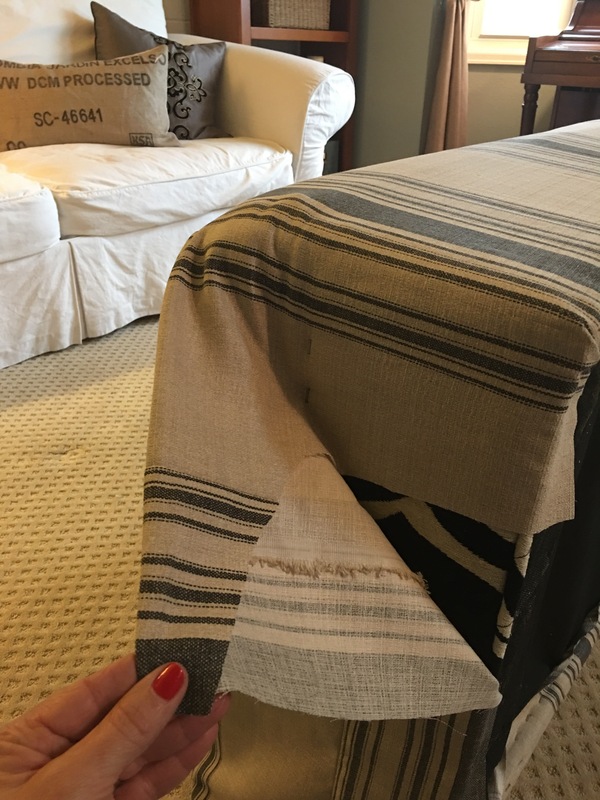 Using some inexpensive craft paint (Martha Stewart – Wild Blueberry), a small paint brush and some painters tape, I created the stripes on the piece of fabric. 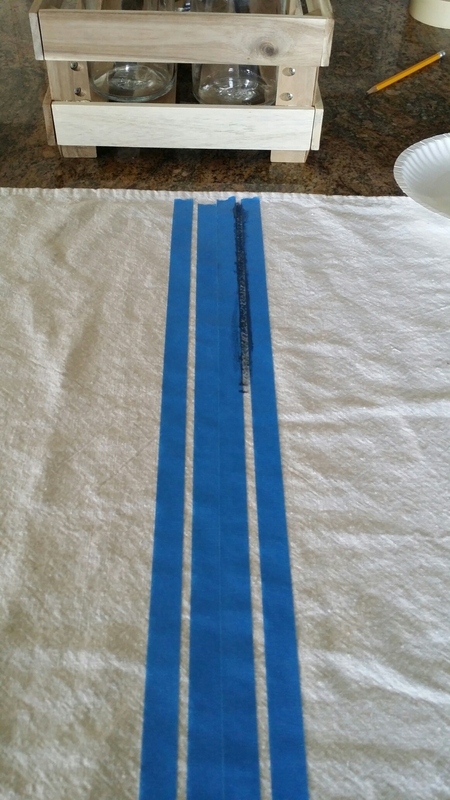 I decided to just do 2 thin stripes on this, but I wanted them spaced a little wider than the width of the tape . So I marked the center of the fabric and put 2 strips of tape side by side directly down the center. Then, using 2 other pieces of tape, I eyeballed a thin stripe outside of the center tape and placed it accordingly. Smoothing and pressing all.of the tape firmly into place. 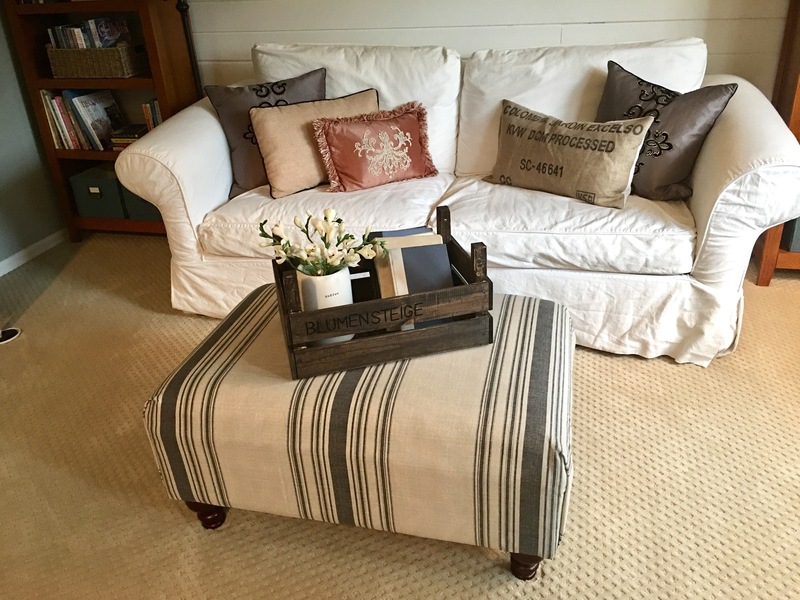 Then, I slapped on the paint….I wasn’t going for perfectly bold, as I wanted the stripes to look a little worn. Waiting only a couple of minutes, I then removed the tape. Worked like a charm. I anticipated recovering a stool that sits in my kitchen. 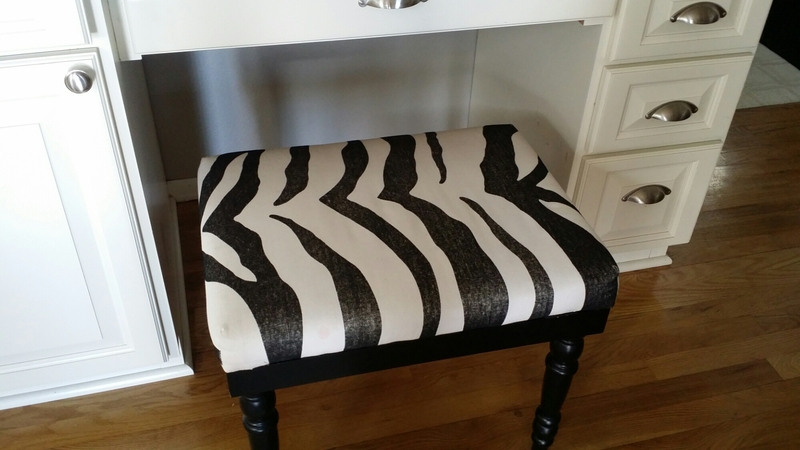 The zebra print is cute, but I was ready for a change. I took the stool apart to recover it. 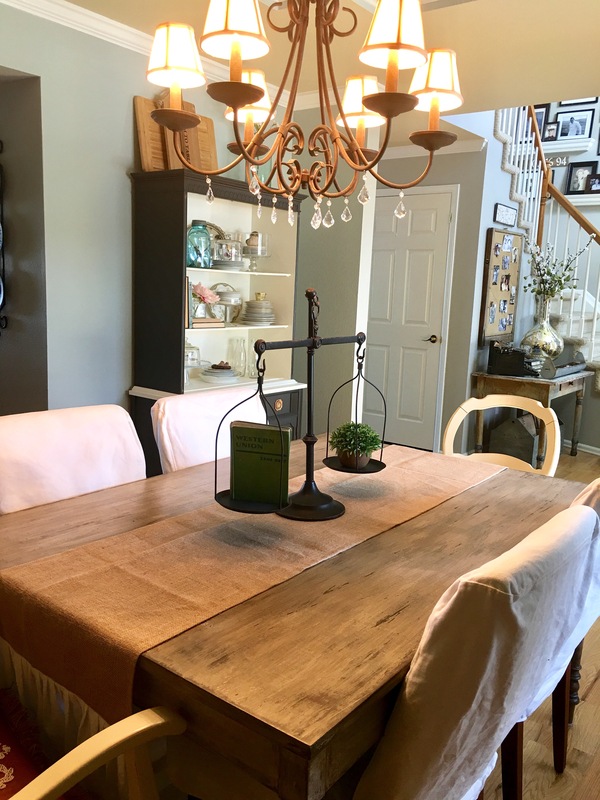 Because you could vaguely still see the zebra print under the drop cloth, I used a 2nd remnant piece of drop cloth under the one I painted. 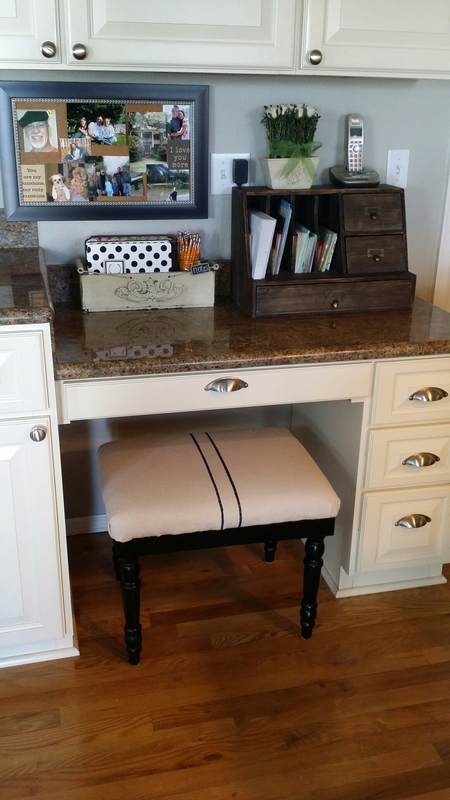 Using an electric staple gun, I quickly attached the new look of my ‘faux French grain sack’ onto the stool. Reattached the frame and waa-laa! Easy update and fun transformation. 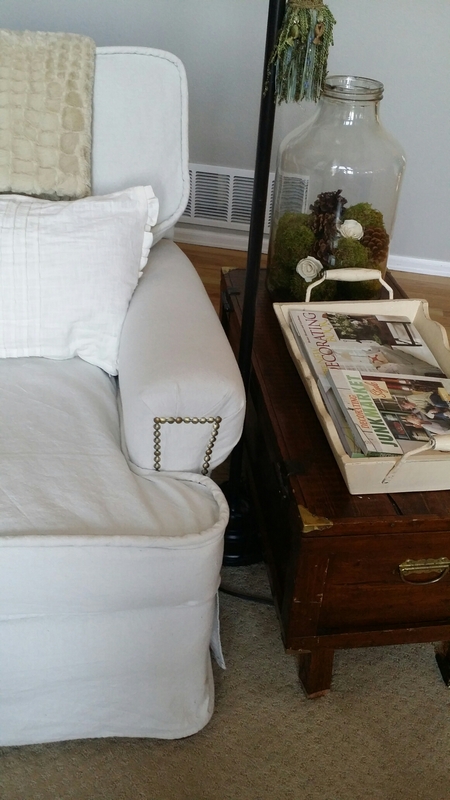 I have lots of plans for some grain sack throw pillows using the remaining drop cloth. The stripes, colors are endless. Years ago, I inherited this chair from my parents. They had it as long as I can remember. Initially, it belonged to my great grandmother, so it is easily close to 100 years old. 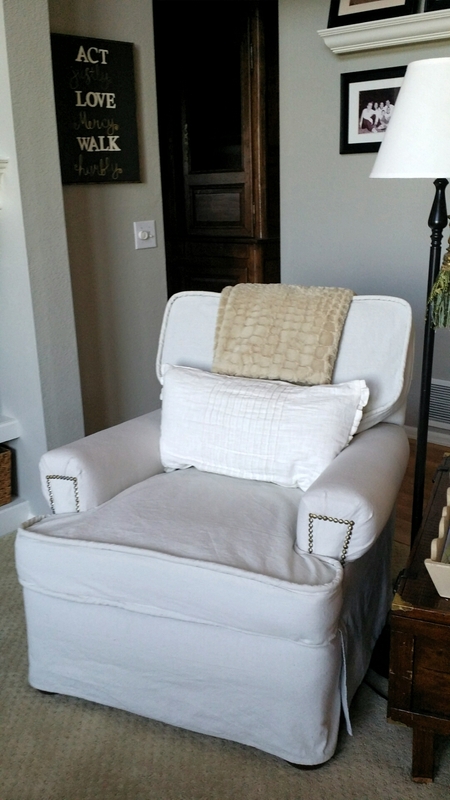 The structure of the chair is remarkable and it’s my husband’s favorite place to sit and read. Over the years, my parents probably had it reupholstered 3 or 4 times. (When I was very little, I actually remember it being a lovely cream colored ‘pleather’…..oh my). 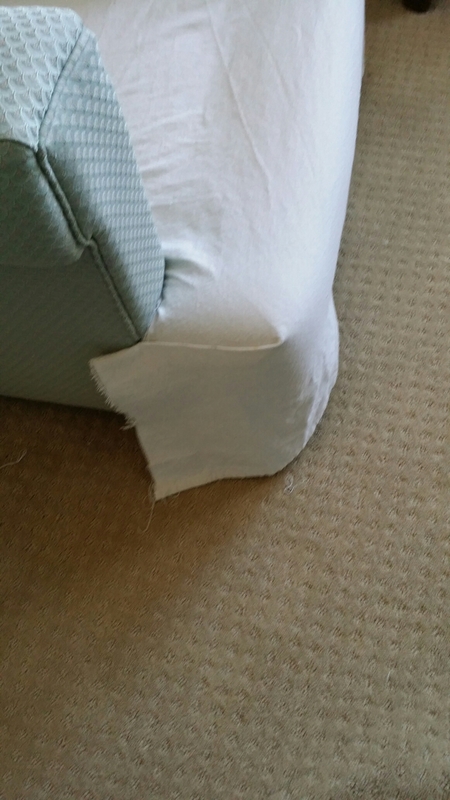 The material that I covered over has been on the chair for well over a decade. This material/print is completely NOT my taste. 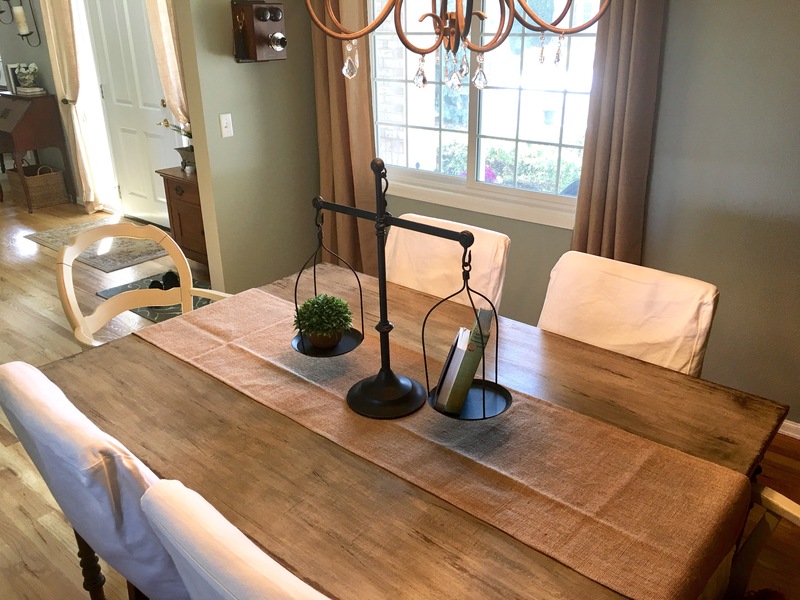 I love the look of linen and french grain sack, but did not want to spend that kind of money on fabric. So, I decided that some drop cloths (washed well and dried) would fit the bill perfectly. 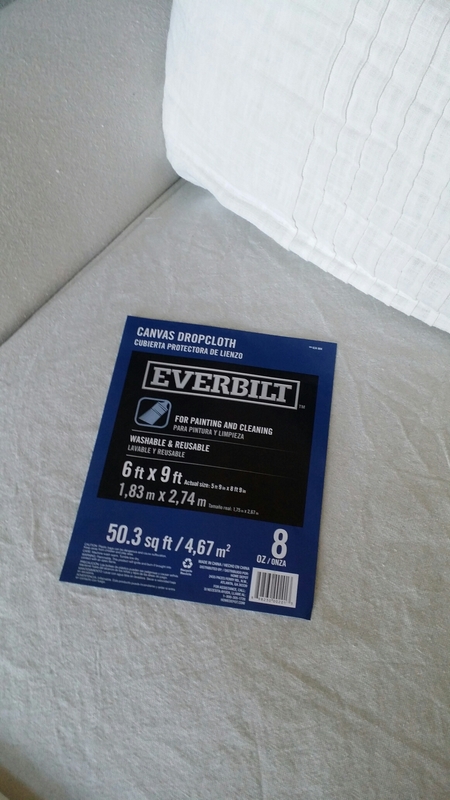 I purchased 2 of these from Home Depot @ $11.98 a piece. And seriously, they wash up so lovely. I put them in with some bleach, detergent and fabric softener and then dried them well. So super soft and easy to work with. 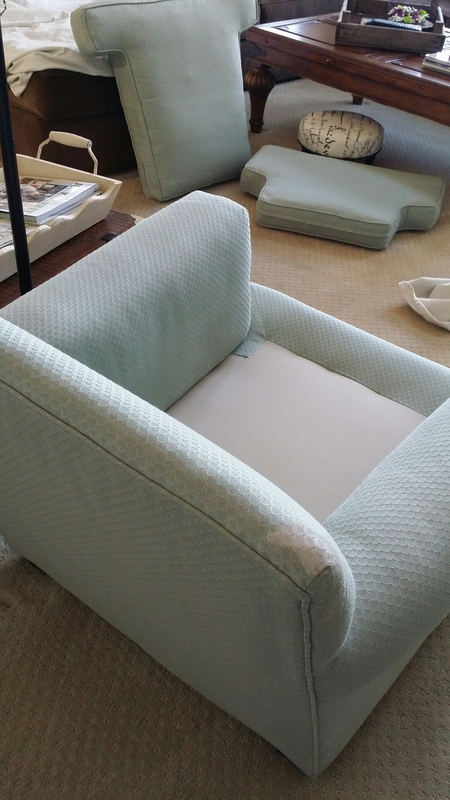 I began by piecing together the frame of the chair, minus the cushions. Then I began tucking, as deep as possible, down into the frame. 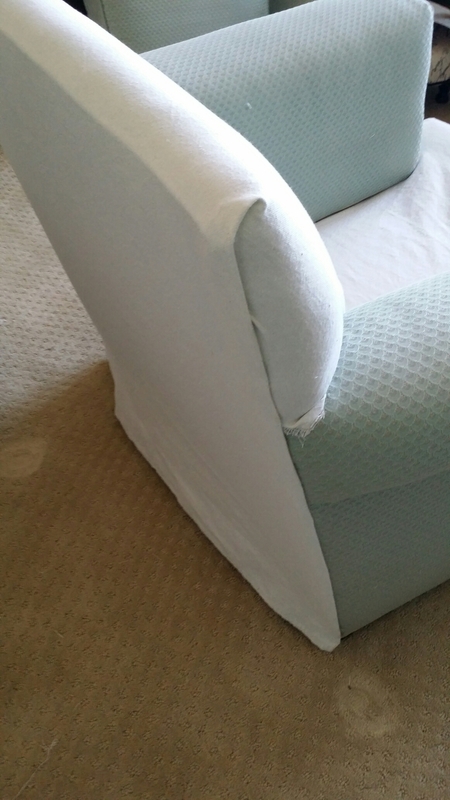 The sides, back and arms were aligned and hot glued into place, as I was not sewing a slip cover for the body of the chair. Hot gluing is the way to go, plus I didn’t want to see staples all over the fabric and I was concerned about being able to reach the wood beneath the existing fabric. 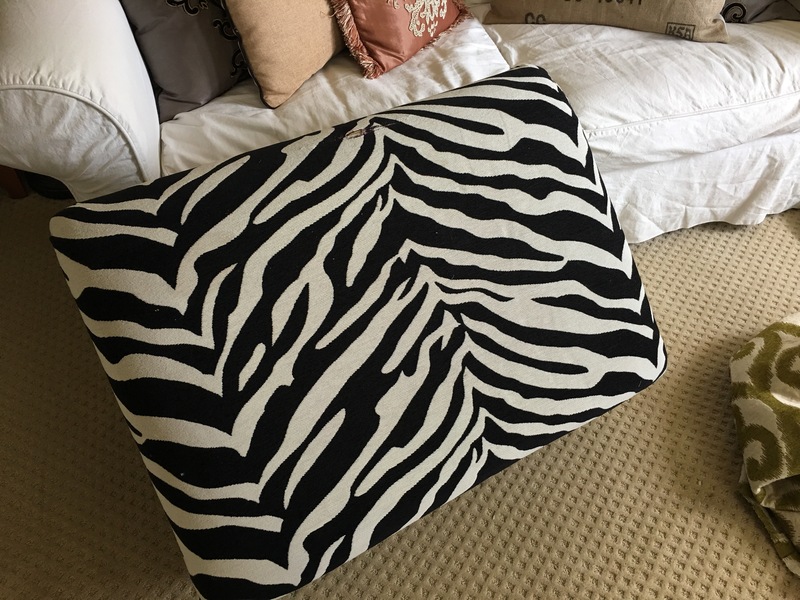 However, if you are a sewing wizard (I’m a basic skills gal with a sewing machine) then you may opt to quickly whip up a slip cover instead. I just folded the seems where I wanted and hot glued it into place, pulling taught and allowing it to cool and dry before letting go. This part moves along quickly. The blessing is, drop cloths have a stitched seam all around. 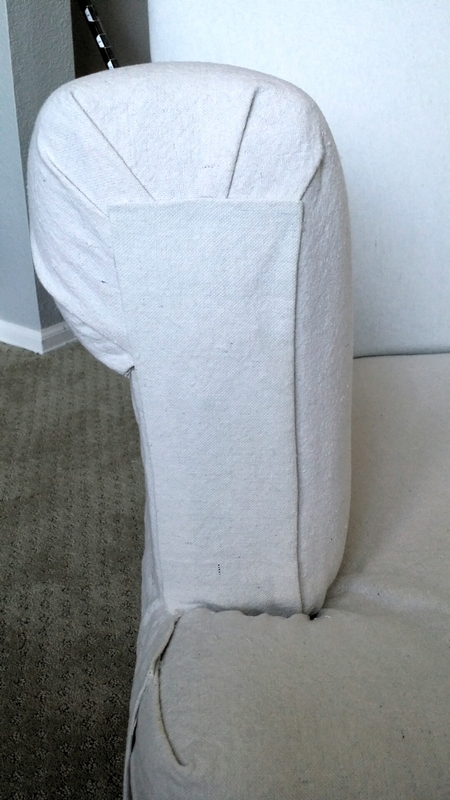 So I strategically made sure to have those seams exposed at the base of the chair for a finished look. I then decided on the location of the folds/pleats at the front of the arms. 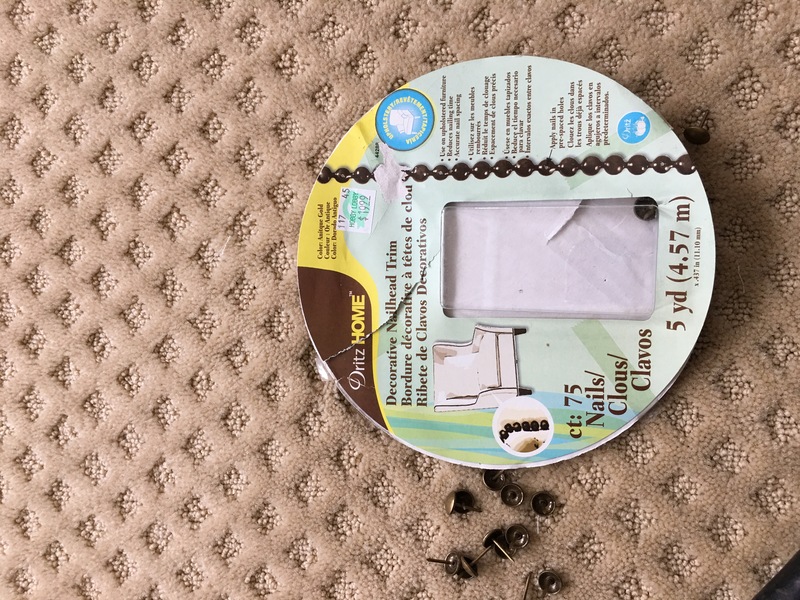 Pinning them in place and then removing pins as I hot glued them in place. 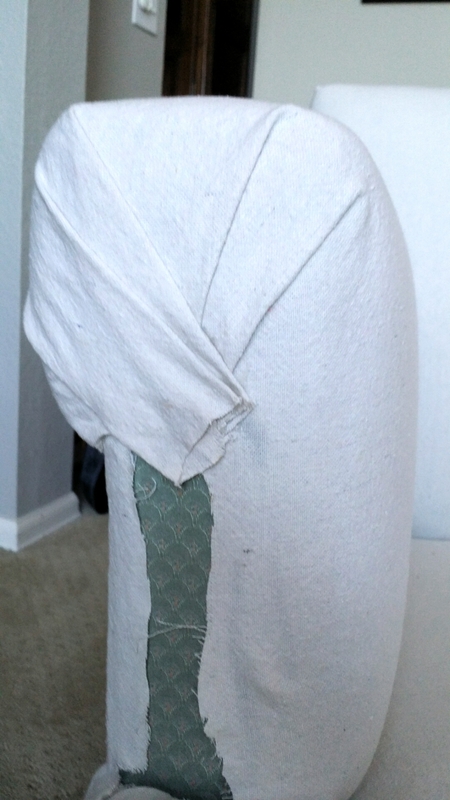 Cutting a small stip, I created a finished edge as I glued, folding the fabric under. 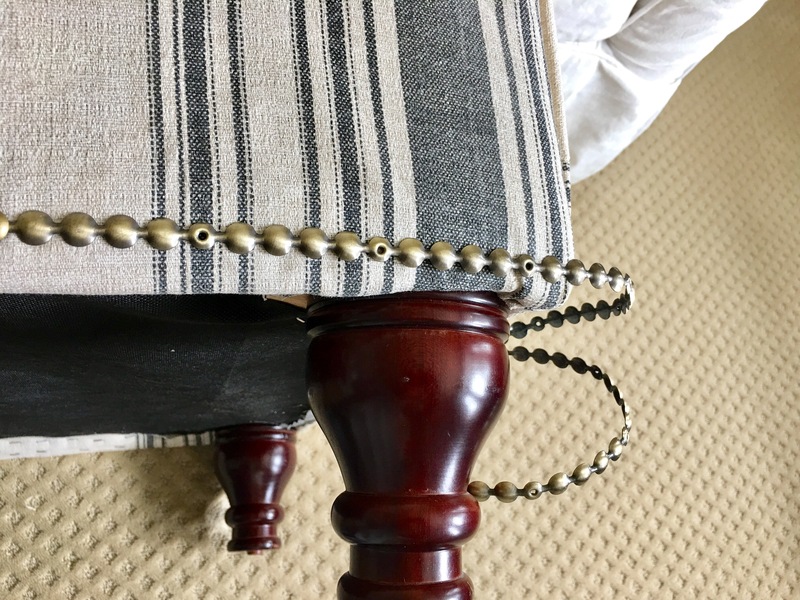 Then finished off those seams with nail head trim….so super simple. This is when I broke out the sewing machine. I did sew a boat load of thick piping. 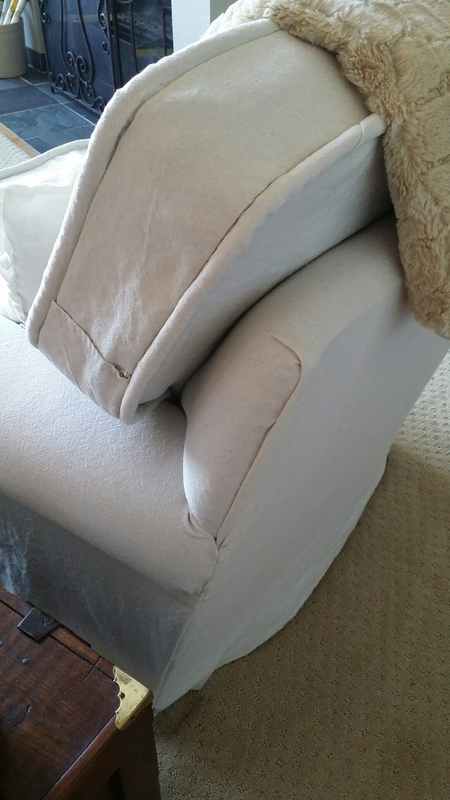 I wanted the 2 cushions to be finished on both sides, that way I can flip them if necessary. 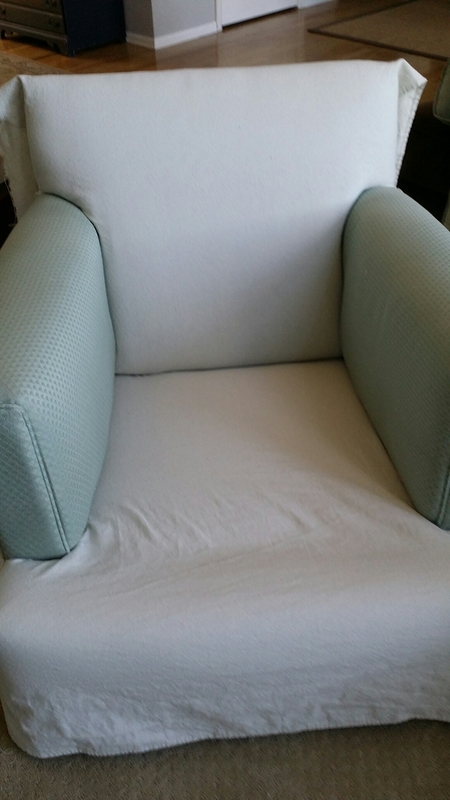 So I traced around the cushions, sewed on the piping and hot glued the remaining seams together, since I was not going to insert a large zipper. 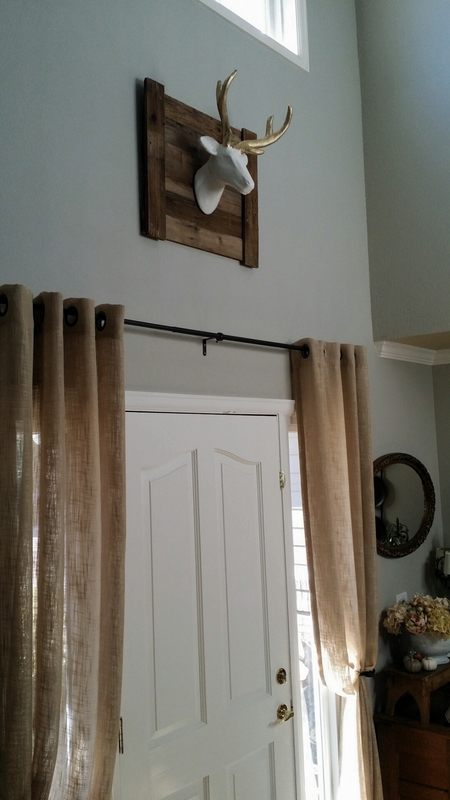 Overall, this would be easy enough for any DIY’er. I suppose if you worked diligently, you could complete this in a couple of days. 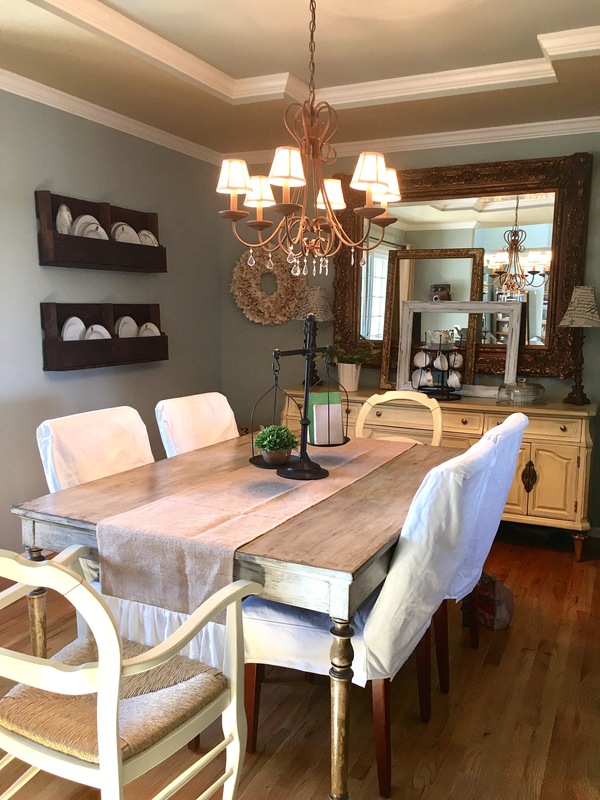 For me, with my kiddos sports activities, daily chores and other home improvement stuff going on, I sort of piece mealed this project to the end result….taking me just under a week. Professional reupholstery would’ve run about $400. (I’ve had an estimate in the past). So my $47 cost has truly brought about outstanding satisfaction. Its such a clean and fresh update. I was on the ‘hunt’ for a good deal. 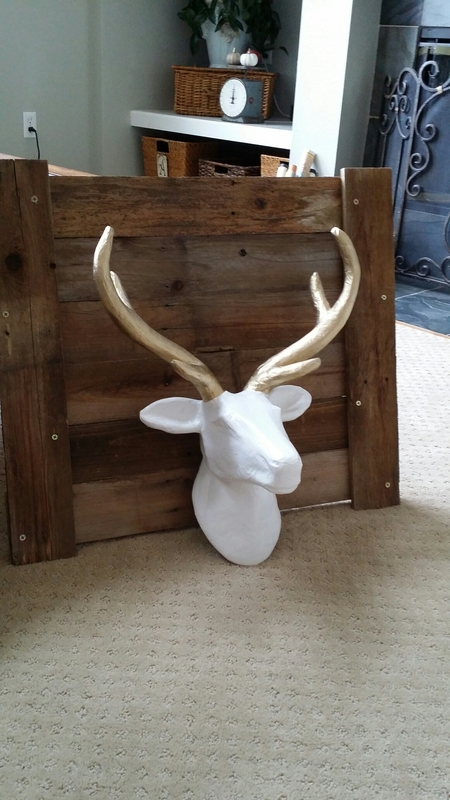 While scoping things out in Hobby Lobby, I came across this fun deer head decor. It was the last one on the shelf. A single shot landed him right in my cart. 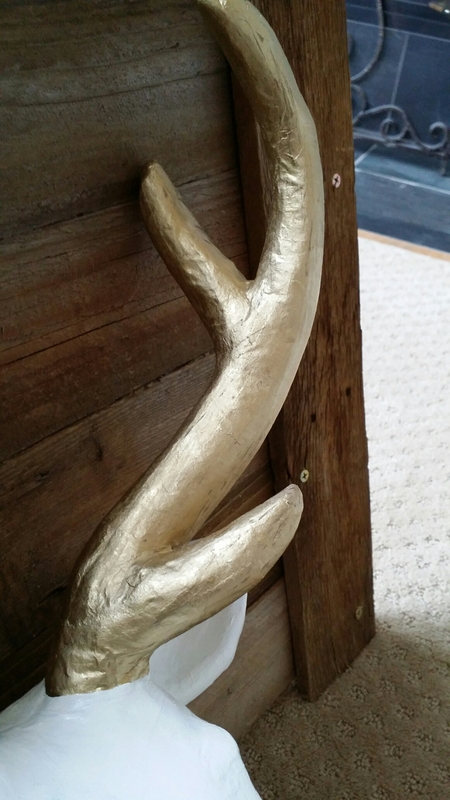 But seriously, I have been wanting a faux stag head mount for some time. 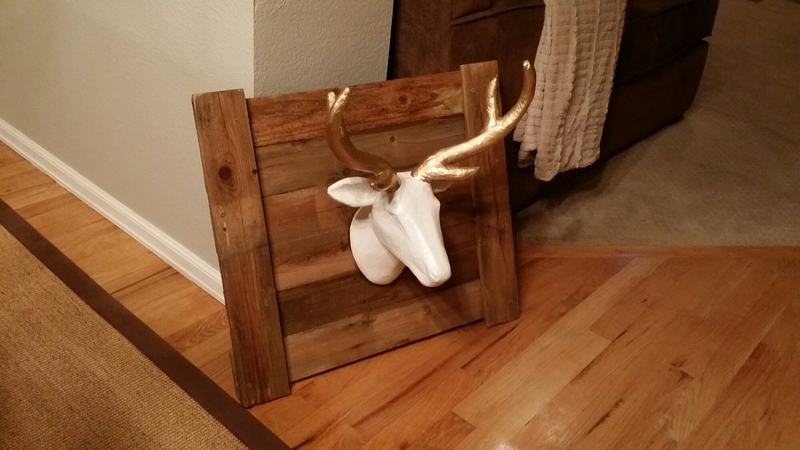 I actually scored this for about $15 using a 40% off coupon at Hobby Lobby. Its been sitting in my workshop for many months. 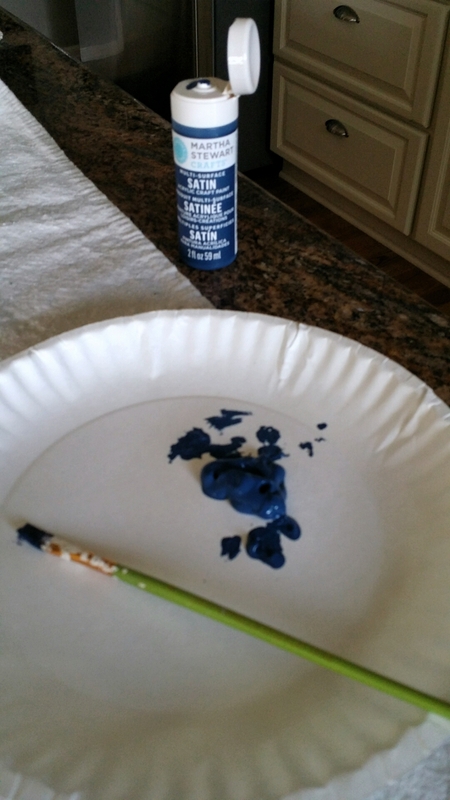 I wasn’t exactly sure how I wanted to paint it or where I wanted to put it. 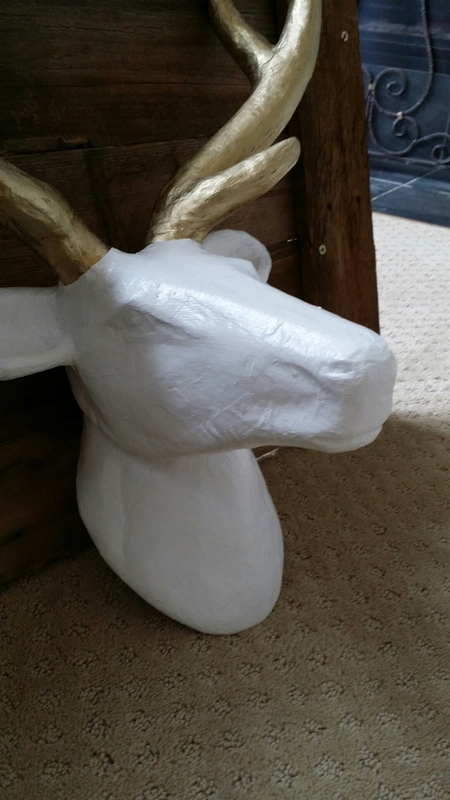 I decided to paint the head a basic white and I used a gold paint pen to make the antlers gold. I have seen these framed and/or mounted clean onto the wall. Felt like it need another dimension to it. 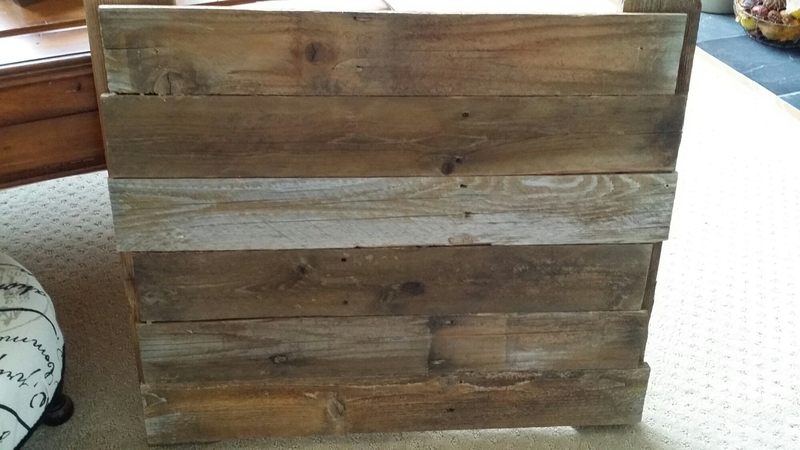 So I created a wood backing, using remnant fence wood that we have stacked up in the back yard. I actually used my ever favorite Gorilla Glue to glue the back pieces together side by side. I let that dry really well for a couple of days. 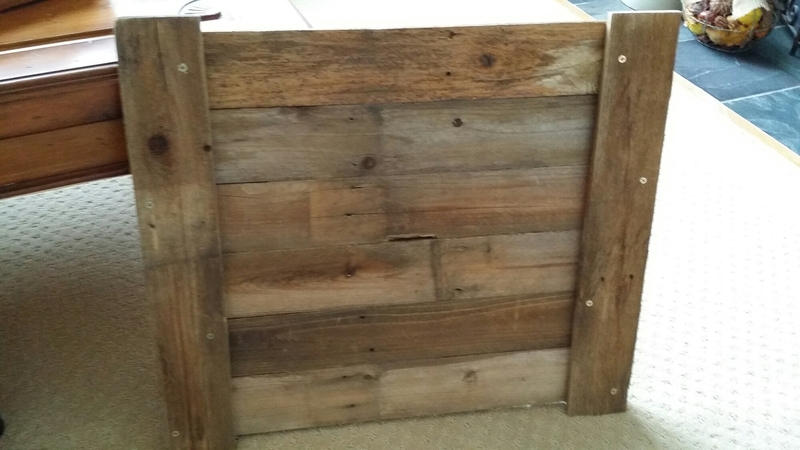 Then I cut 2 other pieces to line both outer sides (covering the uneven edges of the back pieces) and I screwed those onto the boards. This made it even more stable. You can see the uneven pieces here on the back. Then I eyeballed where I wanted the deer head to sit on the backdrop, loaded it up with Gorilla Glue and stuck it on. I let this dry well overnight. 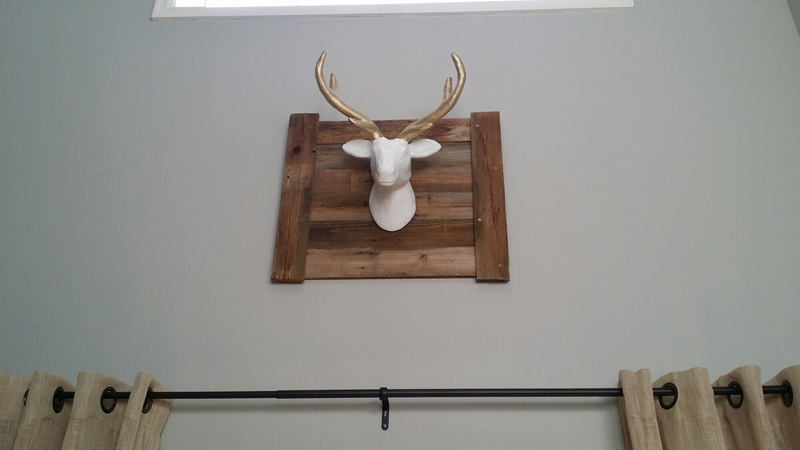 Today, I created a wire hanger for the back and decided on a location for the deer to hang. And here is where he landed…..up above my front door. Whimsical funky chic….totally my style.